Odisha state has the highest amount of rural poverty in the whole of India. Around 62% of Odisha’s total workforce depends on agriculture and allied sectors for employment and sustenance. It is the second most tribal dense state in India, with more than 22% of its population being tribal. The project proposes to work in the districts of Bolangir, Ganjam, Kandhamal, Koraput, Nayagarh, and Rayagada. These districts comprise of communities dependent on either agriculture or forests for their living. The partners involved will try to address poverty problems diverse in nature and extent. The primary objective is to ensure food & Nutrition Security among target group by enhancing income of 8016 families through resilient farming systems to climate change by the year 2015. Durpati Majhi live in a Budhaguda village of Kothogarh Block of Kandhamal dist in Odisha. 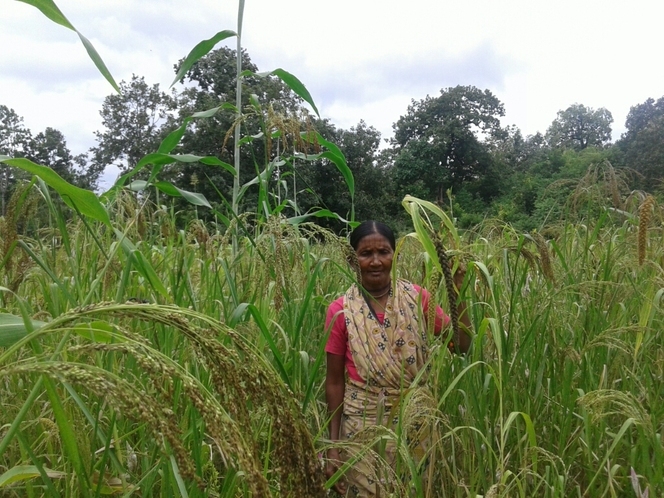 She cultivated millets mix farming through varieties of millets like Foxtail millet 3 varities,Finger millet 4 Varities ,Little millets 4 varieties,Sorghum 1 varieties in 2 acre of land.which is 10 varities seed are suppoorted by NIRMAN.This year they are readopted the millets besed mix cultivation. She produced 700 kg and got benifit of Rs 4000/- . 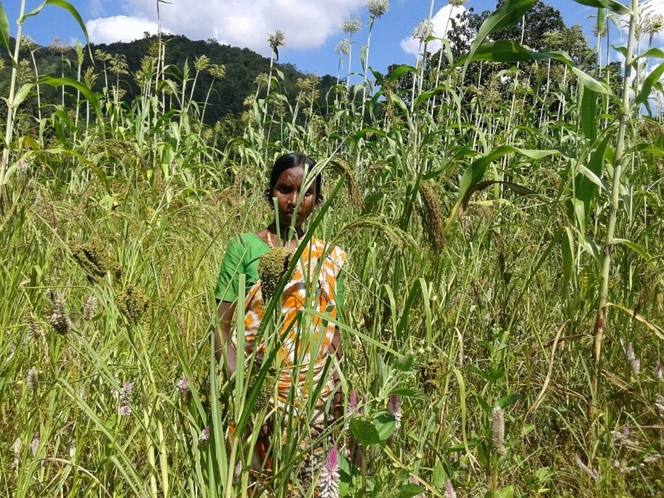 This year the drought situation vanished the crops but their family assited some how by millets farm.Accoding to her if she does not go for cultivate the millet crops this year than surely we will shortly face the hunger periods,. After a 15 year her family has able to cosume the nutrious food grain. Nayamati Mallick live in a Risampanga village of Tumudibandha Block of Kandhamal dist. of Odisha. 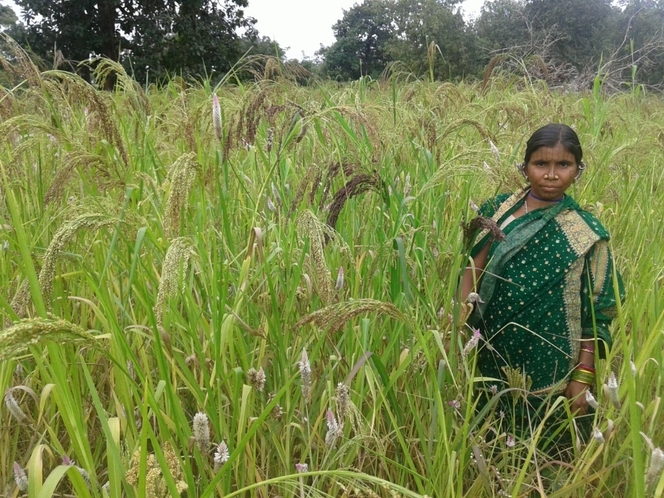 She cultivated millets mix farming through varieties of millets like Foxtail millet 3 varities,Finger millet 4 Varities ,Little millets 4 varieties,Sorghum 1 varieties in 2 acre of land.which is 10 varities seed are suppoorted by NIRMAN.This year they are readopted the millets besed mix cultivation. 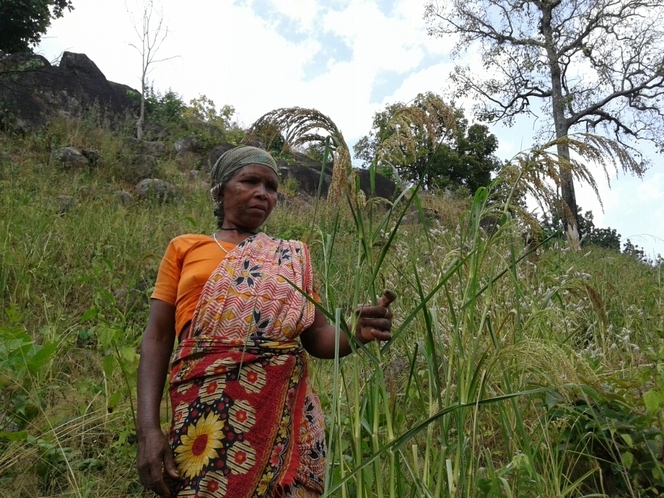 She produced 800 kg and got benifit of Rs 5600/- .After a 18year her family has able to cosume the nutrious food grain.This year the drought situation vanished the crops but their family assited some how by millets farm.Accoding to her if she does not go for cultivate the millet crops this year than surely we will shortly face the hunger periods,because there is no other crops are survived except the millets. Mediali Majhi live in a Dagesguda village of Tumudibandha Block of Kandhamal dist. 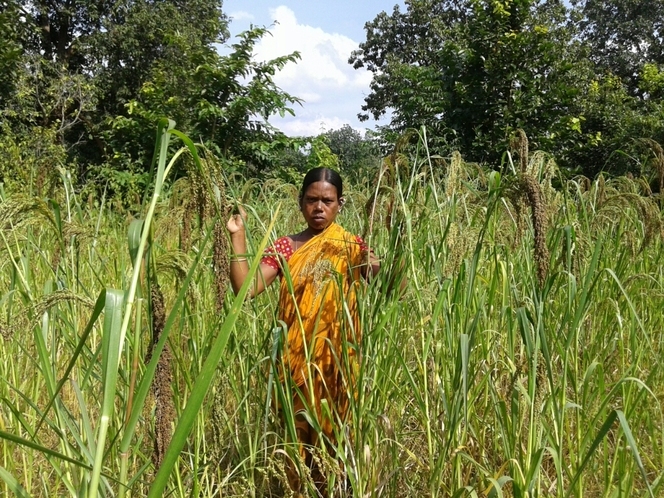 of Odisha.She cultivated millets mix farming like 15 varities of millets and 3 varities of pulses in 1.5 acre of land.which is millets seed are suppoorted by NIRMAN.After 14 year they are readopted the milletd besed mix cultivation. She produced 600 kg and got benifit of Rs 3893/- .This year the drought vanished the crops but their family assited by millets.because there is no other crops are survived except the millets. Pusali Digal live in a Murudumaa village of Tumudibandha Block of Kandhamal dist. 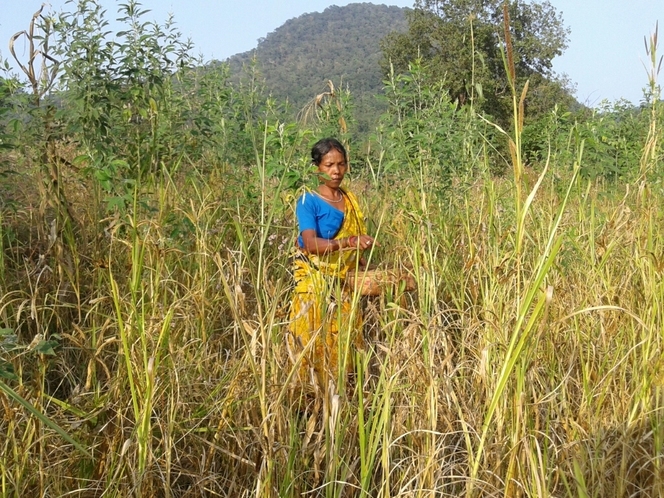 of Odisha.She cultivated millets mix farming through varieties of millets like Foxtail millet 3 varities,Finger millet 4 Varities ,Little millets 4 varieties, ,Sorghum 1 varieties and pulses 2 varities cowpea and Ricebin in 1.85 acre of land.which is 10 varities seed are suppoorted by NIRMAN .This year they are readopted the milletd besed mix cultivation,So this year the diversity of crop like millets &Pulses increased upto 4 varieties to 14 varieties.The current situation of weather is not favorable for paddy. So that cultivated mixed farm will help to sustain their food need. The State Level Sharing, Learning and Sustainability workshop was organized by Udyama from 22nd to 24th December at CYSD conference hall in Bhubaneswar. The Major issues discussed during the event were sharing of learning of sustainable livelihoods initiatives by Udyama. Then eminent dignitaries like Mr. Jagdish Pradhan, SVA, Dr. Ramesh Panda, IAS Rtd. Prof. Radhamohan_Ex-Information Commissioner Odisha, Mr. N M Prusty, CDDMSS, New Delhi, Mr. Basant Kar- Senior Advisor, Coalition Food and Nutrition Security, New Delhi and Mr. Subrat Dutta, India Coordinator- Food Fortification Initiative , were shared their views on Sustainability and different actions by other successful initiatives in the country and around globe. A District Level workshop was organized at Nayagarh DRDA conference hall on Sustainable Development and Community Resilience on 17th of December 2015. The event was chaired by District Collector of Nayagarh. During the occasion the Block development Officers (BDOs) of program block and other district level officials along with program participants were participated. In this program the chair and other dignitaries emphasized upon (Sustainable Development Goal) SDGs and role of different stakeholders in development. Where, Udyama also shared its actions and activities on the field. How Udyama is strategically acting towards fulfilling SDGs also been discussed by the participating member. The Secretary Udyama and other Program Members were also present and shared in the event. A District Level workshop was organized at Nayagarh DRDA conference hall on Sustainable Development and Community Resilience on 17th of Decemeber 2015. The event was chaired by District Collector opf Nyagarh. 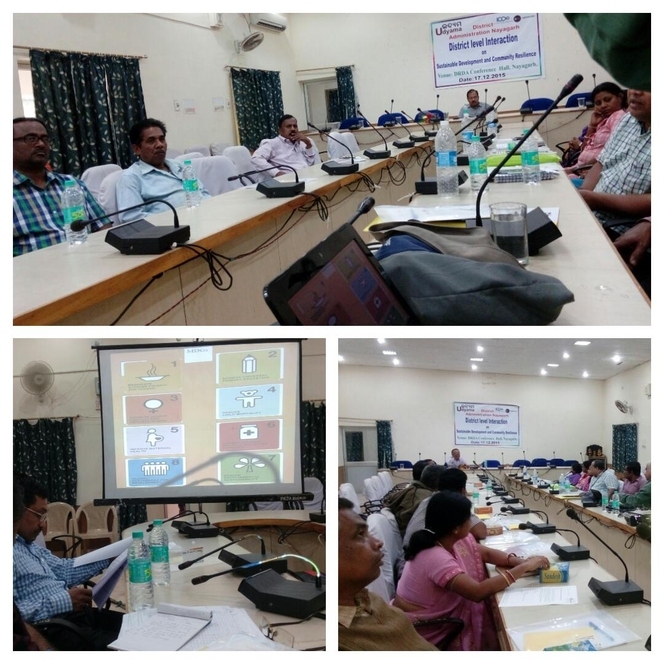 During the occasion the Block development Officers (BDOs) of program block and other district level officials along with program participants were participated. In this program the chair and other dignitaries emphasized upon (Sustainable Development Goal) SDGs and role of different stakeholders in development. Where, Udyama also shared its actions and activities on the field. How Udyama is strategically acting towards fulfilling SDGs also been discussed by the participating member. The Secretary Udyama and other Program Members were also present and shared in the event. Sudali Majhi and Pardash Majhi live in a Murudumaha village of Tumudibandha Block of Kandhamal dist. of Odisha. She cultivated millets mix farming through varieties of millets like Foxtail millet 3 varities,Finger millet 4 Varities ,Little millets 4 varieties,Sorghum 1 varieties in 1 acre of land.which is 10 varities seed are suppoorted by NIRMAN.This year they are readopted the millets besed mix cultivation after 10 year. She produced 500 kg and got benifit of Rs 4000/- .This year the drought situation vanished the crops but their family have got food grain by millets farm. Dunuka Majhi live in a Murudumaha village of Tumudibandha Block of Kandhamal dist. of Odisha. 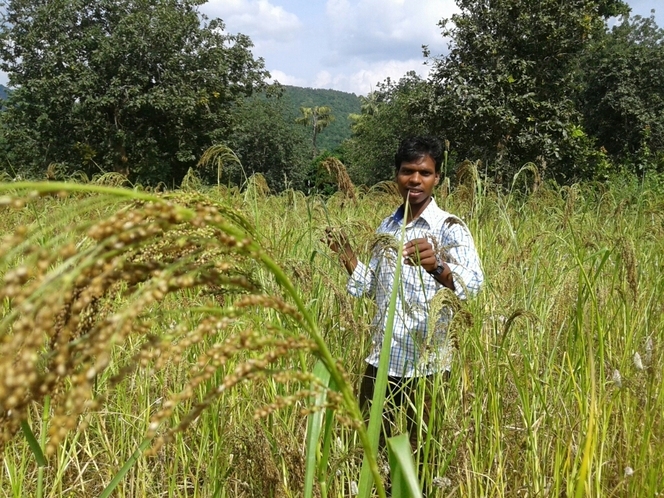 He cultivated millets mix farming through varieties of little millets varieties in 2 acre of land.which varities seed are suppoorted by NIRMAN.This year they are readopted the millets besed mix cultivation after a 12 year back. She produced 900 kg and got benifit of Rs 6000/- .Accoding to her this year the drought situation vanished the crops but their family assited some how by millets farm if she does not go for cultivate the millet crops this year than surely we will shortly face the hunger periods,because there is no other crops are survived except the millets. Ecological farming through millets . Pusali Majhi live in a Ugamaha village of Tumudibandha Block of Kandhamal dist. 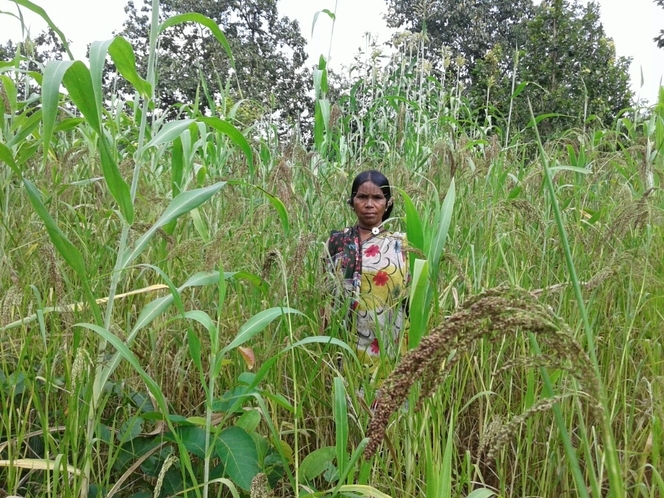 of Odisha.She cultivated millets mix farming through varieties of millets like Foxtail millet 3 varities,Finger millet 4 Varities ,Little millets 3 varieties, ,Sorghum 1 varieties and pulses 2 varities cowpea and Ricebin in 1acre of land.which is 10 varities seed are suppoorted by NIRMAN.This year they are readopted the millets besed mix cultivation,So this year the diversity of crop like millets & Pulses increased upto 3 varieties to 13 varieties. 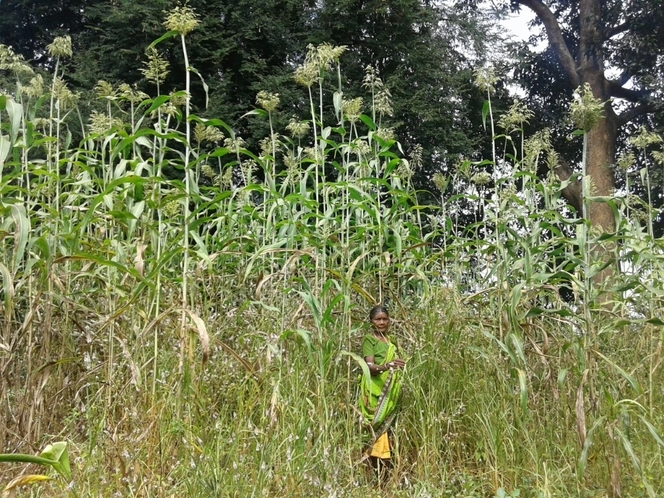 This year the drought situation vanished the crops but their family assited some how by millets farm.Accoding to her if she does not go for cultivate the millet crops this year than surely we will shortly face the hunger periods,because there is no other crops are survived except the millets. So cultivated millets mixed farm will help to sustain their food need. Dadkali Majhi live in a Ugamaha village of Tumudibandha Block of Kandhamal dist. of Odisha. 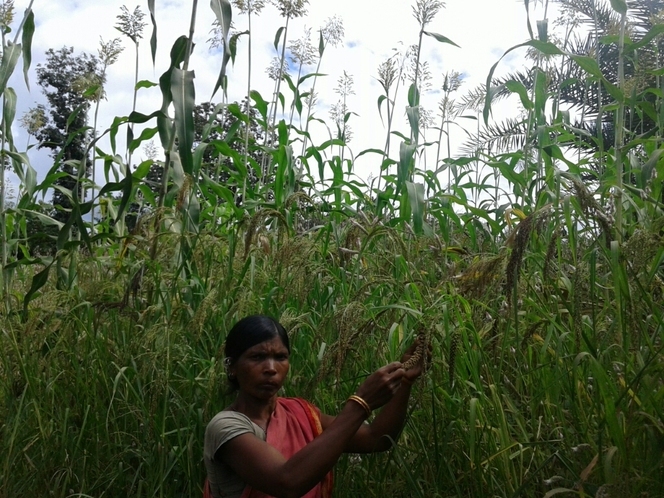 She cultivated millets mix framing through varieties of millets like Foxtail millet 3 varities,Finger millet 4 Varities ,Little millets 4 varieties,Sorghum 1 varieties in 2 acre of land.which is 10 varities seed are suppoorted by NIRMAN.This year they are readopted the millets besed mix cultivation. She produced 900 kg and got benifit of Rs 5000/- .This year the drought vanished the crops but their family assited some how by millets farm.Accoding to her if she does not go for cultivate the millet crops this year than surely we will shortly face the hunger periods,because there is no other crops are survived except the Millets. She said After a 13 year her family has able to cosume the nutrious food grain. 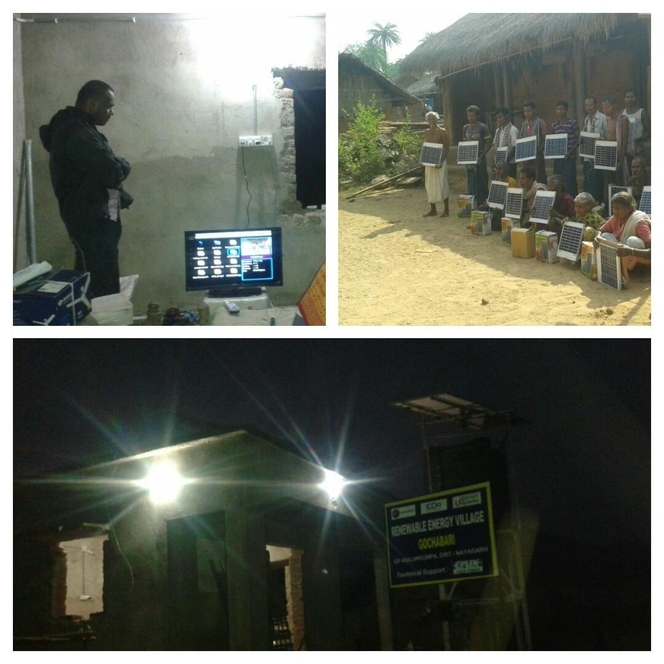 Gochabri a tribal village got electricity through Solar Energy System for individual household use and community activity together. The Village Community Centre is also equipped with light, fan, charging points, extension points and TV. The 750Wt Solar Power unit installed at community center will provide 6 hours back up and this will help in community activities of the villagers. 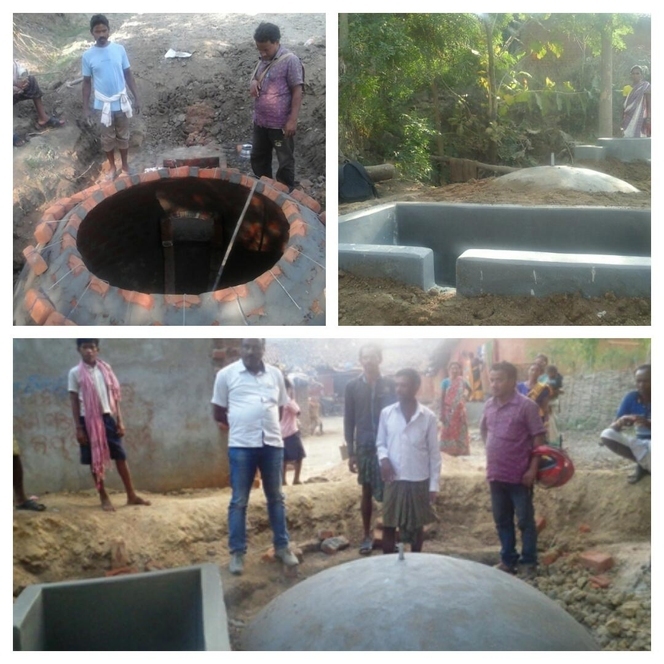 In order to aware and create access of rural poor to green energy sector Udyama initiated some individual household level bio gas plants in both Nayagarh and Boalangir district. Recently 3 such units have been completed and will be operationalise in next one or two week. Odisha Renewable Energy Development Agency (OREDA) is acting as the technical partner for the purpose through its local technical experts. 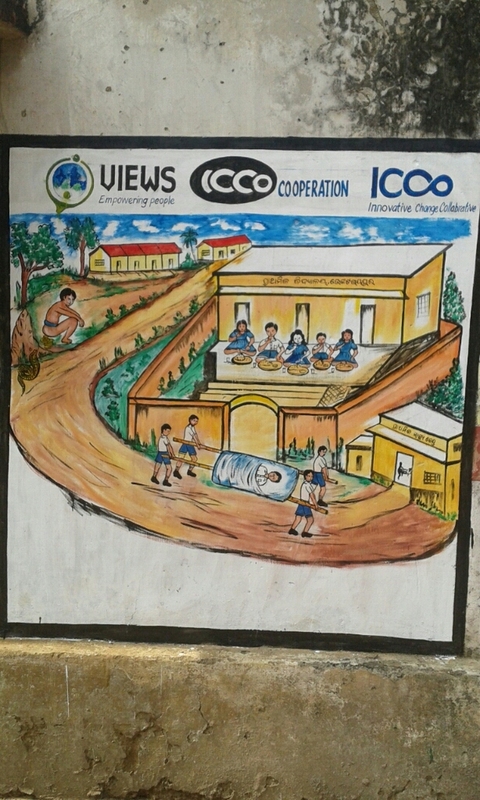 VIEWS generates awareness on water and sanitation through wall paintings. VIEWS supported seeds and handhold support for cultivation of vegatables to marginal farmers. 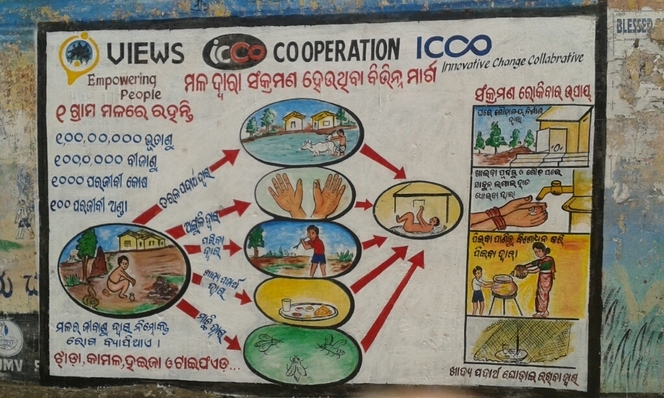 Wall paintings on sanitation was created awarness among rural population of ganjam district with the support of ICCO Cooperation in Ganjam district. 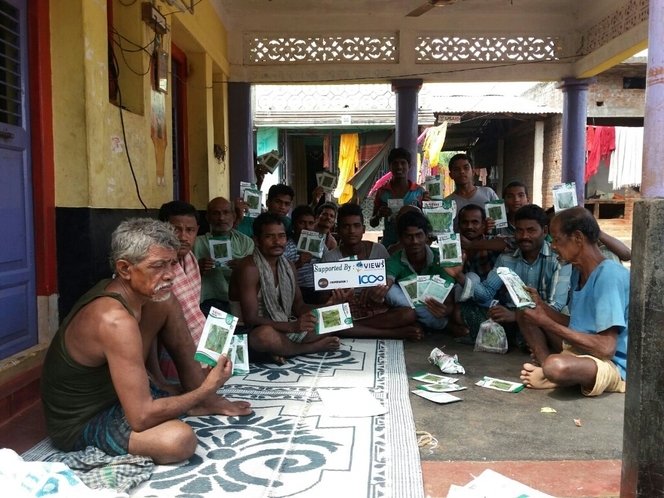 VIEWS distributed vegatable seeds to all the marginal farmers to enhance vegatables cultivation to earn marginal remunuration. Simanti Majhi live in a Ugamaha village of Tumudibandha Block of Kandhamal dist. 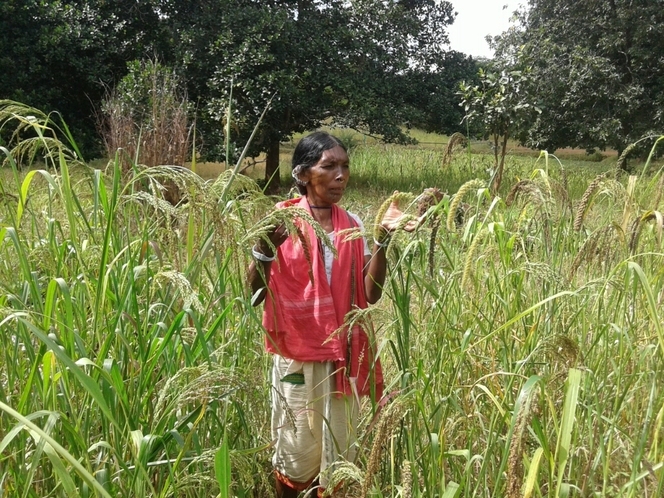 of Odisha.She cultivated millets mix farming through varieties of millets like Foxtail 3 varities and Little Millets 4 varities in 2 acre of land.which is seed varities are suppoorted by NIRMAN, This year they are readopted the milletd besed mix cultivation.The current situation is they lost paddy crop due to drought. 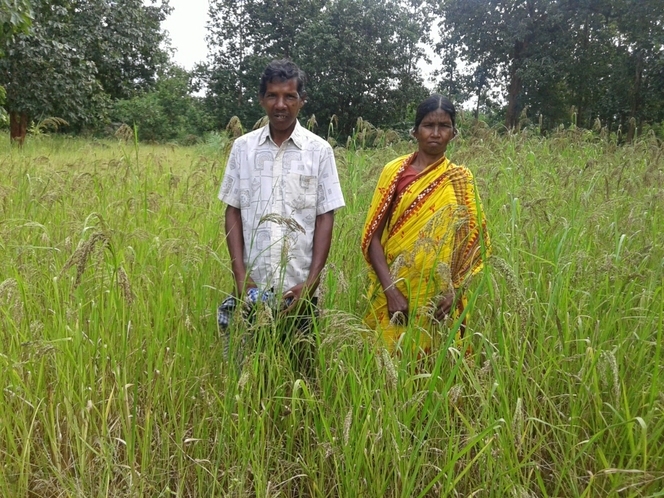 So they hoped that cultivated millets farm will help to sustain their food need and income . VIEWS conducted signature campaign with the help of students to teach signature of villagers and promote literacy in rural areas. VIEWS in association with Odisha tradational fishworkers forum organised state level seminar. The charters of demand of fisherfolk submitted to the minister of agriculture for policy level changes as well as coastal livelihoods enhancement. The field staff of VIEWS organised regular women self help group meetings and promtes savings and internal lending among members. Along with the livelihoods practices and government schemes also discussed. 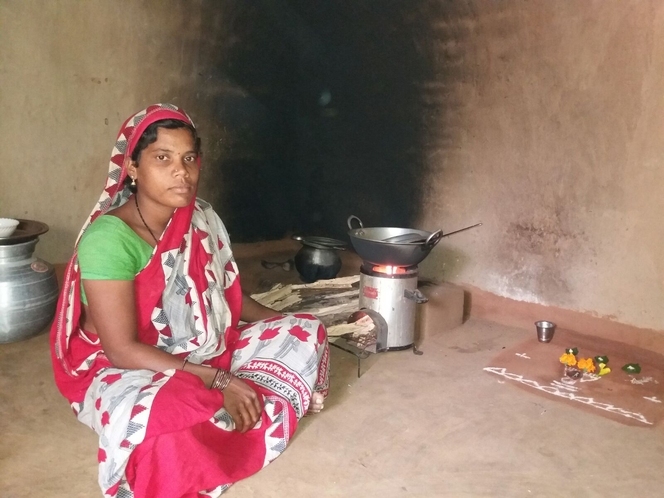 Mamata Mallik of Jharapalli village is very happy to use fuel efficient stove, which is consume less fire woods than the traditional Chulha. She is getting time to take rest , because is consume less fire woods and it is preparing food in very less time too. Now she is able to taking care of her child properly. 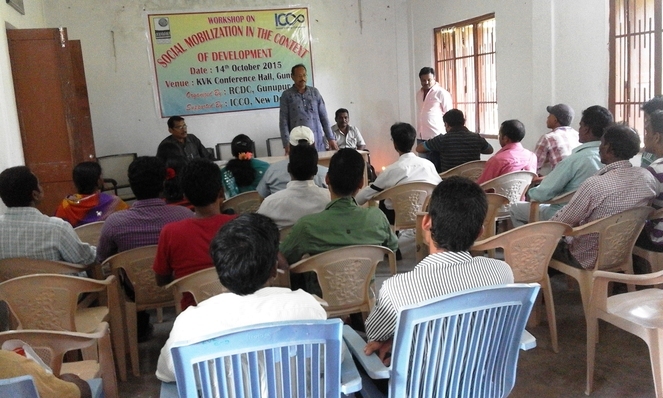 A Sanitation Training was organised in Chikiti block. This training was organized with an objective to create awareness among the school children on the process of hand washing and use of toilet. Main objective of this program to create awareness to keep clean the environment and pollution free village. The staff of VIEWS, the head Master of the school and village leader kept their thoughts in front of the school children, because they are the future of the country. 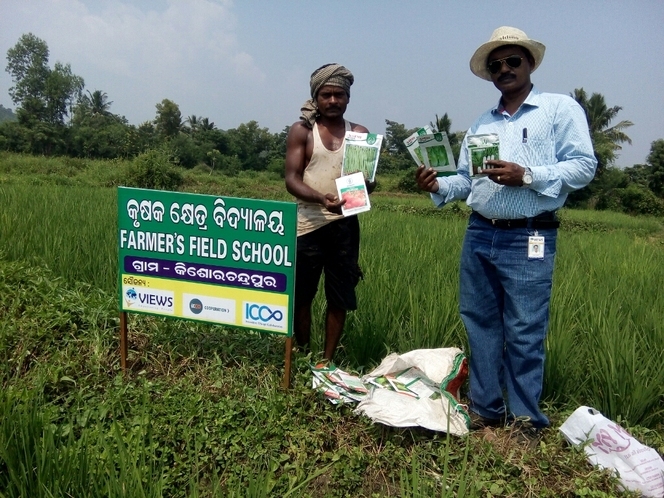 A farmers field school spreads the packages of practices as a model to all the farmers. Most of the farmers visited the farmers field school and appreciated the work. Community Resource Provider are the backbone of the program. If the Community Resource Provider's will be capable then they can promote the successful practices to fulfill the objective of the program. 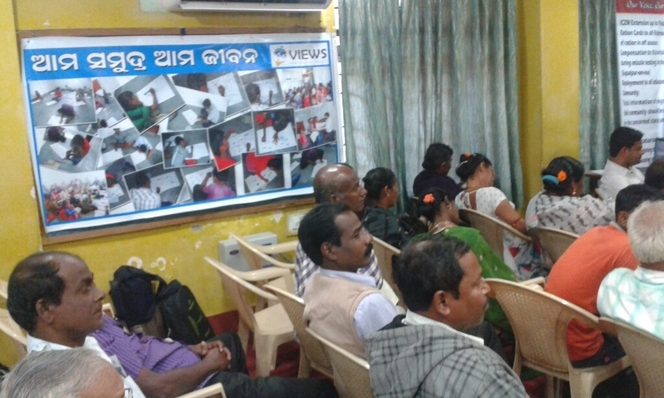 So VIEWS conducted training for the capacity building of the community Resource Provider in the operational area of VIEWS. VIEWS promote the Community Resource Provider by building capacity on Community Based Organization Management and preparation and use of organic manure in the agriculture field sustainable agriculture. VIEWS organised community resource persons training in Chikiti block. The objective is to enhance skills on sustainable agricultural practiçes and packages of practices. After that the sucessful farmers provides handhold support to marginal farmers in the field. A Farmer's field school for the farmers of Chikiti block. 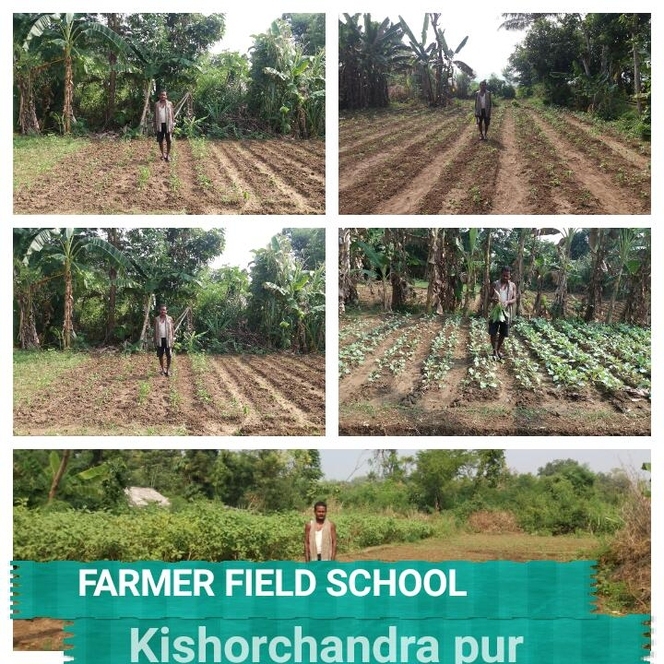 A farmer of Kishorchandrapur has set up a farmer's field school in Kishorchandrapur village. 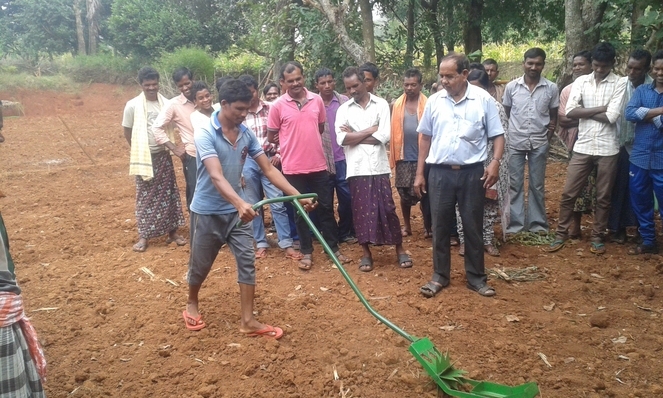 Farmers from different village of chikiti block are visiting this field school and learning the techniques to use organic manure to get safe and nutritious food. 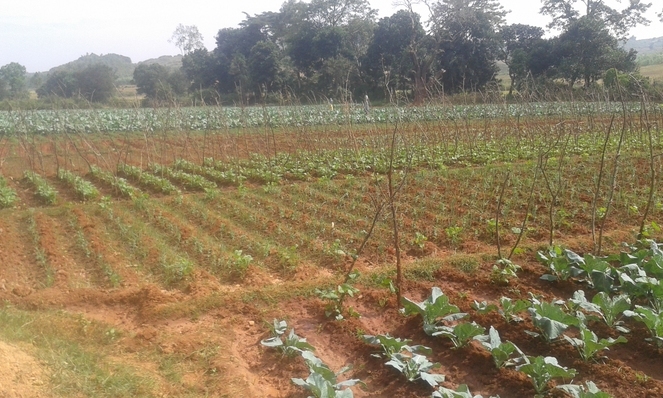 In this Farmer's Field School the vegetable have grown by using organic manure which is prepared by the farmers and cultivating in a systematic manner. 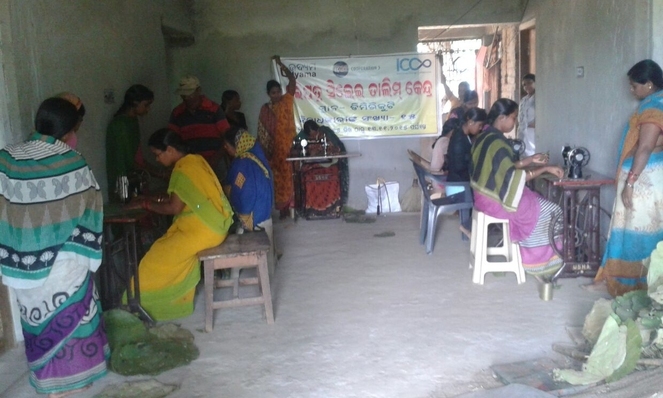 Tailoring training is going on at Markandi village of Rangeilunda Block of Ganjam District. With the objective to employable to the villages adolescent girls and youths of Markandi village, VIEWS started a tailoring training at the community Center. There are 16 adolescent girls are learning the cutting, designing and stitching of the female clothes. The teacher and the participants are very happy the village girls are learning tailoring which will make them employable. A training on Improving accessing to market & making Market work for poor is facilitated by ICCO in Bhubaneswar from 16th- 20th Nov.2015. On behalf of RCDC. Mr. Suresh Bisoyi and Ajoya Kumar Mohanty attended and learn the procees of making market access to poor. 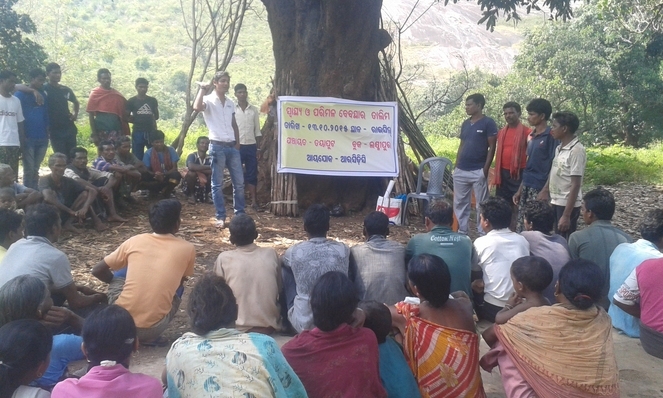 A forest conservation training is being organised in Dombasora village on 10.11.15 where 40 participants attended and discussed about various method of community forest management. Dist level NGO workshop is organised in Koraput on 27.11.2015 where a shareing and reflection was made regarding the interventions undertken in SLIO project. Dist level top govt official, NGOs, Activists, Media, PRI meembers, CRPs, SLIO staffs participated and shares their experience. 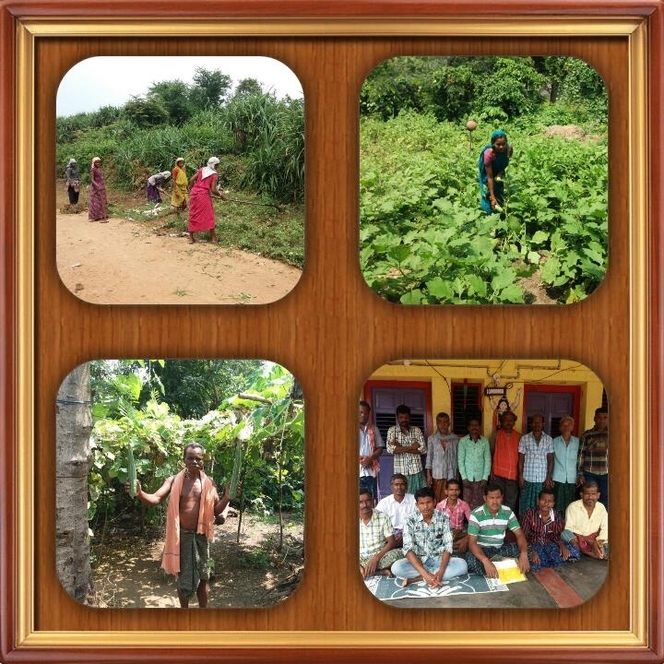 The part of Nayagarh district where Udyama_ICCO program is operational is rich with NTFP and majority of household earn their additional livelihoods from leaf collection. Addition to this the poor tribal households do manual stitching of leafs in to leaf plates, which fetches low price. Often the women engaged in leaf stitching sells their produces to middlemen and small traders at lower rate and the traders sale those with higher return with some value additions. Recently to add some value the product, Udyama organised a leaf stitching training for 25 women of Dimirikuti Village under Sariganda GP in Nayagrh district. This added skill with the women for processing raw leaf plates by stitching it in machines. This will fetch some additional income to the primary collectors and the group, which are engaged in leaf collection and plate making. The group had undergone a training of 25 days in two batches. All trainees formed their SHGs in their village and do their stitching work individually and marketing in group to enhance bargaining power. Gochabari is a small tribal village in Kulurkumpa GP and almost inaccessible to out side and in the bank of river. 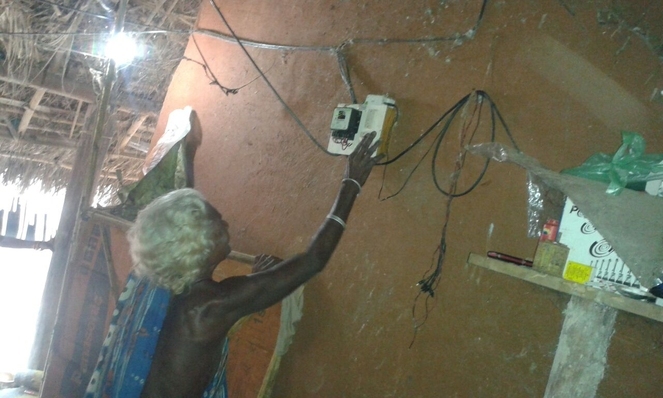 Recently Udyama_ICCO SLIO program set up one Integrated Energy Center along with home lighting system to all 28 families in the village. The central solar power system is installed in newly constructed Community Hall of the village with 750 Watt capacity . This is providing 6 hours backup for all the lighting system of the center along with a Television, one fan and 10 charging points. All household of the village provisioned with 2 light point and mobile charging facility. To mange the entire power bank of the village, user committee is operational to manage, maintain and overall charge of the unit. Nutrition and Disease Management is the science and it directly link soil, crop, weather, and hydrologic factors with cultural, irrigation, and soil and water conservation practices to achieve the goals of optimizing nutrient use efficiency, yields, crop quality, and economic returns that may impact the environment. 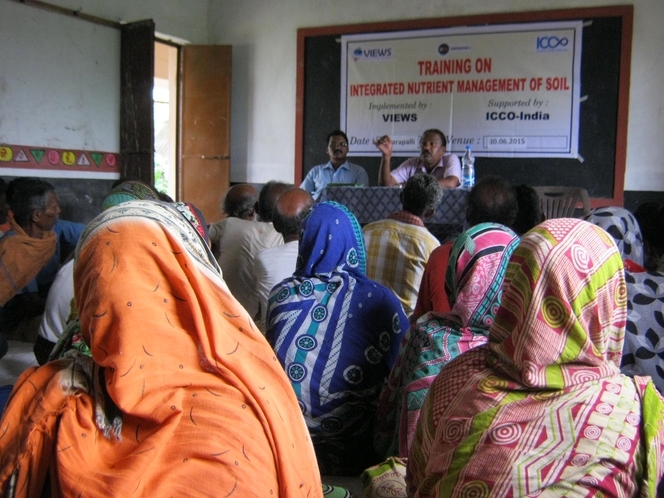 There are 5 Trainings on Nutrient Management of Soil and Disease Managements were organized in three blocks of Ganjam district. 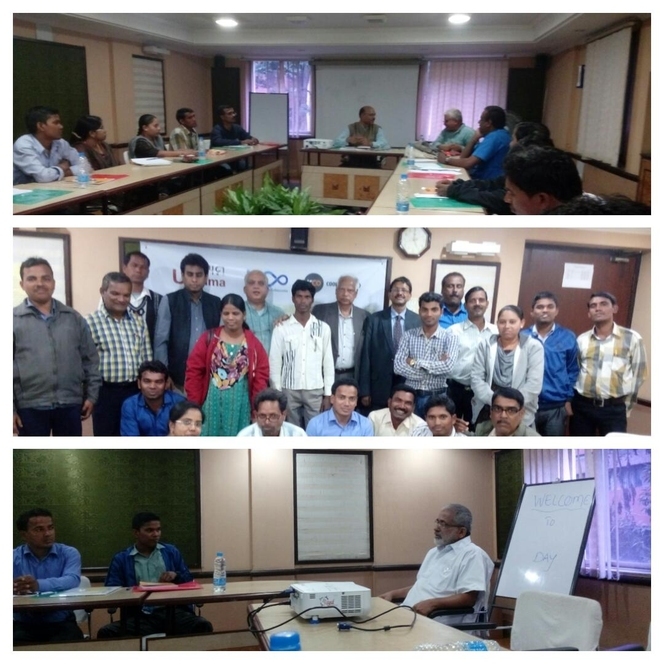 The objective of the training were to create awareness among the farmers to know the importance of the soil test, to need of nutrient management, and disease management to build knowledge to control traffic on the soil surface which helps to reduce soil compaction, aeration and water infiltration. The farmers trained “ how to take soil sample for soil testing and Pest Management Training” with resource support from District Level Agriculture Department. There were 167 participants from 3 blocks including Resource Person Mr. Bhairabi Nayak, the District Agronomist and Mr. Balaram Subudhi, the agronomist of Chatrapur Block explained the importance of Integrated Nutrient Management and Integrated pest management and Improved Agricultural Practices like SRI (System of Rice Intensification) and other package of practices like Seed priming, Germination test, Seed treatment, transplanting appropriate seedling, use of mechanical weeder. He gave onsite training to collect the soil sample for testing. Mr. Nayak also explained that the Government is doing the soil test. The farmers were very happy to have the above knowledge systematically. 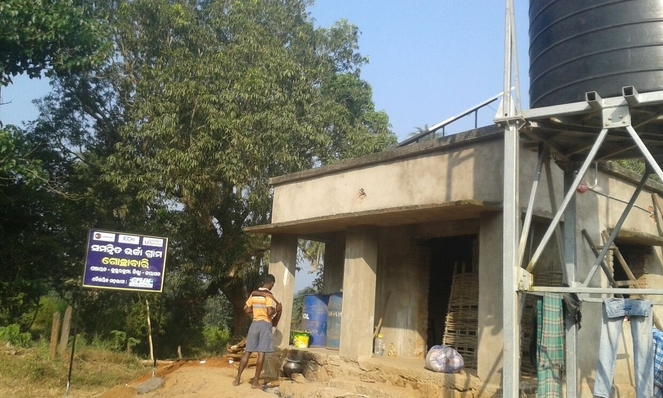 Ganjam is known for open defecation and unhygienic surroundings created by the open defecation practice. The practice of bathing at open ponds and wells and using the same water for other household chores is another problem. The impact of poor water, sanitation and hygiene practices also impacts children and their health conditions. Access to safe drinking water and sanitation facilities is long term problem and its impact on the health conditions of children especially under 5 is paramount. 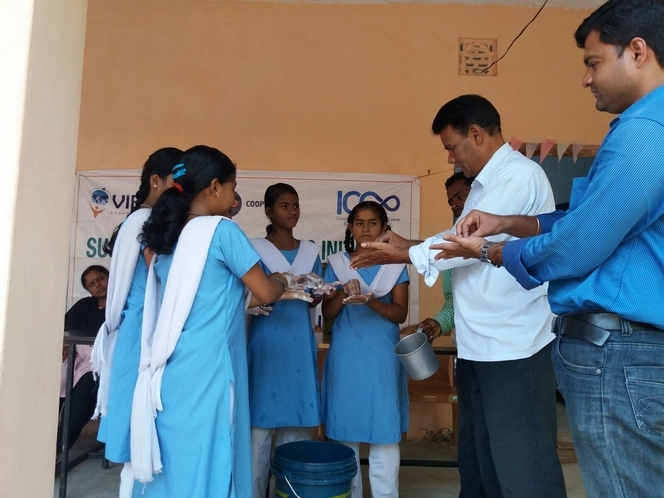 The team of VIEWS conducted village cleaning campaign with the schools and women self help group members with the aim of generate mass awareness on water and sanitation among population. As a part of campaign, various activities like drawing competition on clean village, debate competition on among the school children of 6 schools on role of people in clean village conducted. Along with a foot rally also organized on sanitation campaign to sensitize people on sanitation. 128 participants participated in this campaign. The team members trained women on sanitation practices and motivated to undertake various village development activities through their groups. 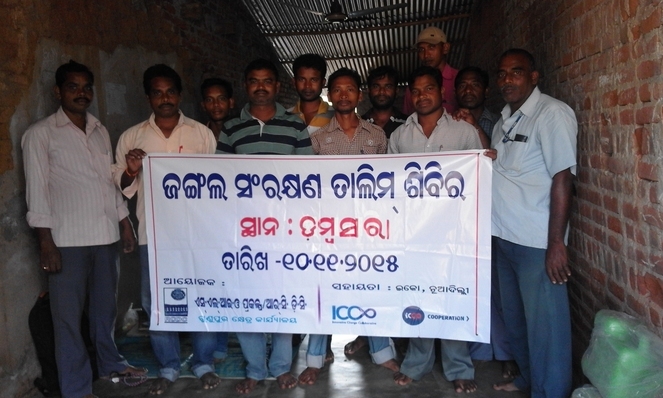 Series of village cleaning campaign were conducted through collectives in two villages such as Aladipur and Tareipatpura villages of Ganjam. The Self Help Groups are taking initiative of village cleaning and cleaning of well in Aladipur village. 31 participants from the SHGs participated in this village cleaning activities. The applications also submitted to block office for household latrines in various operational villages of VIEWS to access sanitation schemes. Mrs. Nayakani Pradhan aged 49, a poor elderly woman staying with her husband and her son in Palli village under Gobindanagar Panchayata of Chikiti Block. Her Livelihood depended on wage labour. Due to old age she was not able to earn her Livelihood smoothly. According to the villagers sometime her son is neglecting them also. Mrs. Nayakani and the villagers requested VIEWS to provide some assistance to earn a meaningful livelihood for them. She showed interest to do hotel in her village, then the staff of VIEWS interacted with Mrs. Nayakani, and selected as a MED. With the involvement of Mrs. Pradhan the staff of VIEWS a business plan was prepared for Tiffin stall. So VIEWS provided asset to start hotel in her village. She started a hotel in front of her house and she is preparing wada, piaji, pokadi, kakara and tea. Her husband is helping to manage hotel and maintain the asset register. According to her she is earning 200 -300 INR per day which is helping to maintain family. Villager are taking breakfast from her hotel and telling that she is preparing very tasty food. She is very happy to get this assistance from VIEWS. Voluntary Integration for Education and Welfare of Society (VIEWS), a non-profit Organization released the study report on “ Coastal Livelihood Security of Marine Fishing Communities in Ganjam District of Odisha: Issues and Challenges” with the support of ICCO Cooperation.Mr. Sumant , Consultant presented the study findings and key suggestions in a state level seminar. The working group on Fisheries for 11th Five year plan rightly argues that-―Indian Fisheries is a sunrise sector. With third position in fisheries and second in aquaculture, the country has high potential in the sector for rural development, domestic nutritional security, employment generation, gender mainstreaming as well as export earning, that only few other activities can provide‖. The study analyses the livelihoods of marine fishing communities in the Ganjam district of Odisha, using the Sustainable Livelihoods Approach (SLA). The study analysed the key issues and challenges affecting the livelihoods of the poor and identified possible areas of intervention in the coastal fishing communities in Ganjam district of Odisha. The wide array of ―assets‖ – i.e. the natural, physical, social, human and financial and the impact of the policies, programs and functioning of institutions related to the subsector was studied and analysed in the context of availability as well as access to the assets for the stakeholders. The study developed qualitative indicators with the help of review of secondary literature, to monitor changes in livelihood and possible factors hindering the growth of the subsector. The rationale of the study to tap the untapped potential for livelihood security for marine fishing communities in Ganjam, taking into consideration the development challenges that have evolved overtime, there is a serious need to assess and study the challenges faced by Odisha in general and Ganjam in particular in the context of livelihood security and enhancement strategies for fisheries sub-sector. The broad objective of the study is to assess the livelihood security of fishing communities in Ganjam district of Odisha. To analyse the actors and factors affecting socio- economic condition of fishing communities in Ganjam. To analyse the livelihood of marine fishing communities in Ganjam, Odisha using the Sustainable Livelihood Approach (SLA). To analyse the policies, programs and institutions in implementing the development agenda of fishing communities in Ganjam, Odisha and its impact on their livelihood The key findings out of the livelihood analysis of different livelihood groups: High dependence on open-access or common property resources (CPRs). The open access nature of resources resulted in too many fishermen chasing too few fish, and consequently wide fluctuations in supply. Thus lack of steadiness in supply and a high degree of perishability makes development of standards and perfect market very difficult.  The lack of boat and other necessary fishing gear in the context of traditional/artisanal restricts their access to the sea, despite the open-access or common property resources. Moreover, inadequate investment in modernizing traditional systems The wage- or share-earning fish workers in production, fish processing and trade-related activities and shared owners of motorized fishing craft suffer the effects of a poor asset base, because of declining production(fish catch) and subsequently fluctuating income that are barely sufficient to meet subsistence needs year round.  The boat owner is always indebted to the trader and often he is forced to sell his catch at the rate demanded by the trader. The source of the credit is mainly relatives and moneylenders. But it is observed that the relatives help in mobilising credit from the moneylenders and sometimes they also pay from their own pocket. The cost of the credit is very high and often it hovers around 36% to 40% per annum.  The unclear terms of ownership of homestead land characterizes the poor. The kutcha house roof is often blown away in cyclone and is also affected in flood. Lack of ownership also means that the poor can be evicted from their place of residence whenever the Government decides to change land use.  Fishing activities are affected by seasonal lows. This is reflected in poor intake of food, poor health care, increased alcoholism, gambling and fights among men, dependence on credit at exorbitant rates of interest. The number of boats lying idle on the beach is also an indicator of seasonal unemployment..  Fishing is characterized by long and difficult physical labour, uncertainty of catch, high risk (vulnerability to disasters) and lack of insurance. The owners of non-motorized artisanal craft and all wage/share earning crew members are subject to these characteristics. The livelihood groups affected by volatility in income are fish processors and petty traders, who have to compete with larger traders for the landed fish.  Minimal return to the fishers in marine value chain. The perishability of the fish, along with limited access to market and lack of credit, favour of buyers in the value chain  Absence of transport and storage facilities. The fishers lacked cold storage, processing and packaging facilities as well as transportation to reach other markets. The traditional customs and traditions in a way come in conflict with the modern technology and thus impede the development of the fisherman. The class conflicts between the communities prevent them from uniting and presenting a united front before their exploiters and mighty stakeholders.  Survival Migration or diversification of occupations on a seasonal basis to meet basic subsistence needs is another coping mechanism. Seasonal migration of men (and sometimes women). In this context it is observed that the children education and up bringing get affected and the older people in the households also receives less attention and care. The living conditions at the new working area are often pathetic and full of difficulty. Moreover, the cost of migration is much more than the gains from migration and it indicates that migration was undertaken out of necessity rather than opportunity. Migrant workers also have to contend with partial payment (or sometimes non-payment) of wages.  In households headed by single women, women‘s earnings through manual wage labour meet the family‘s needs regularly or seasonally. Single-woman-headed families are among the most burdened families in fishing villages. Their access to fish declines because of competition and low investment capacity. This is particularly so during lean periods. The exploitative nature of fishing markets and the increased emphasis on technology undermined the conventional role of women played in the value chain the fishing trade became a male dominated activity with women reduced to being daily wage labourers. 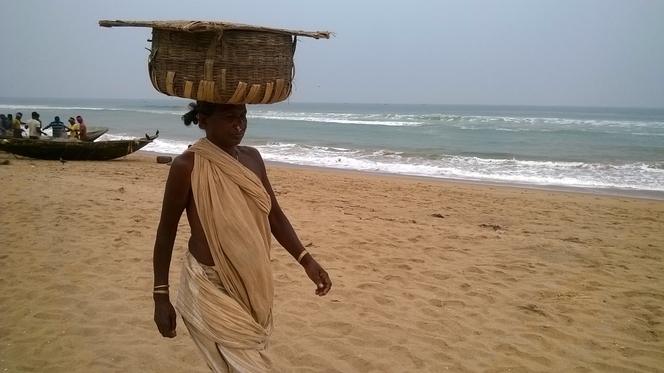  The fishing communities in coastal Odisha suffered from poor health. According to state of health report in Odisha, Ganjam district has highest number of people suffering from AIDS. The fact has been verified and validated during the field segment study. It is also observed that many teenagers and adult people migrate to big cities in search of alternative occupation, as they find fishing as an occupation is no longer as remunerative as they expect it to be, and often they get affected to this fatal disease Lack of space inside the house forces many people to cook in the open or under the hut during the rainy season. 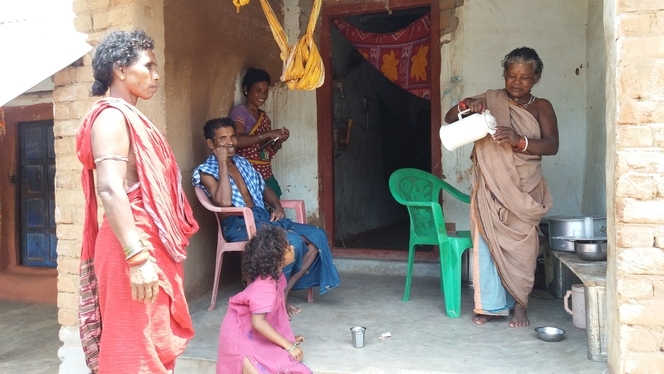  Lack of access to private or public latrines to all households in several villages in Ganjam, irrespective of the social and economic status of a family.  Large families, including households with at least two couples that have a low proportion of earning members to dependents fall in the poor category.  Poor families are usually unable to send their children to schools, either because they cannot afford it, or because of their dependence on children‘s earnings  A family‘s economic health can be damaged by the chronic ill health of the main wage earner, disproportionately high expenditures on health care for the family, and poor access to affordable and effective health care. The consumption of alcohol by the fishermen is a part of their daily diet plan. From the field level group discussion and one to one interaction with the fisher folk community validates that on an average they spent around Rs 1200-1500 per month on alcoholic drinks. Sometimes to quench their thrust they borrow from others (moneylenders & relatives) at a monthly interest rate to consume alcohol. The presence of habitual drunkards ultimately drains out the family resources and assets, if at all created.  The rise in marine exports followed by instant cash payments to fishers led to men retaining control of earnings and spending their income on alcohol. The food security of the households gets affected, alcoholism led to wife beating and ill health among men.  Marginalization occurs among people when traditional livelihoods are threatened by competition from more efficient systems of production and trade. Traditional boat owners, crew members with no asset base, basket traders, net weavers and menders, are the most vulnerable population in this category.  Information gap on price and market has reduced the bargaining power of the fisherman. The lack of asymmetry in information on prices and demand of the various species in the bigger markets is the prime reason behind reduced margins to the fisher folk community and particularly small scale fishermen. 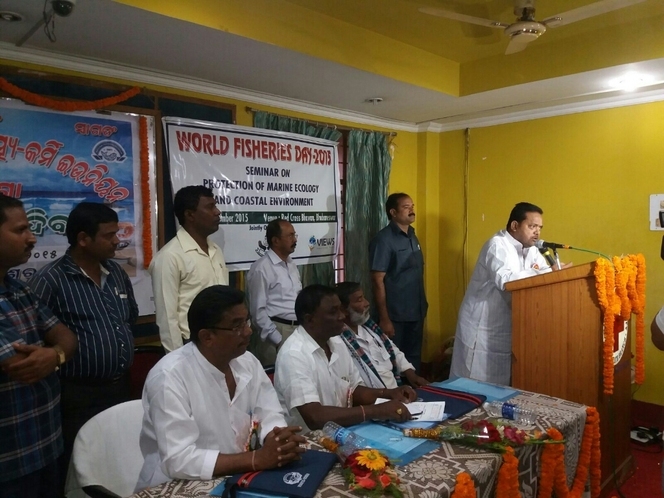 Increased access to the sea, financial assistance for elderly fishermen, and special schemes for fisherwomen were some of the demands put forth by fishermen from across 851 villages in six districts of Odisha who had gathered here at Bhubaneswar to celebrate the World Fishery Day. 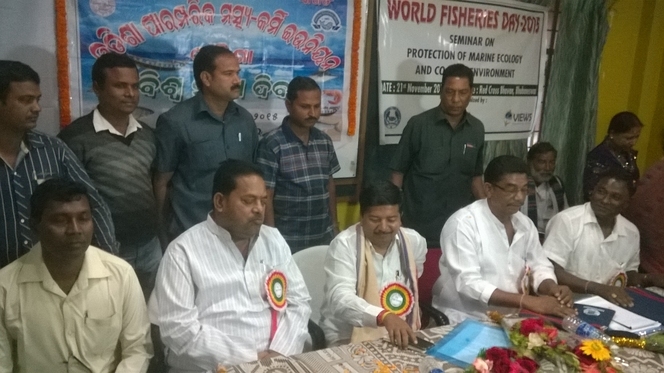 To celebrate the occasion a seminar titled “PROTECTION OF MARINE ECOLOGY AND COAST ENVIRONMENT” was jointly organised by the Odisha Traditional Fish Worker’s Union, VIEWS, United Artist’s Association and Coastal Council on the occasion. Agriculture Minister Pradeep Maharathi inaugurated the event and assured all possible help from the state government. 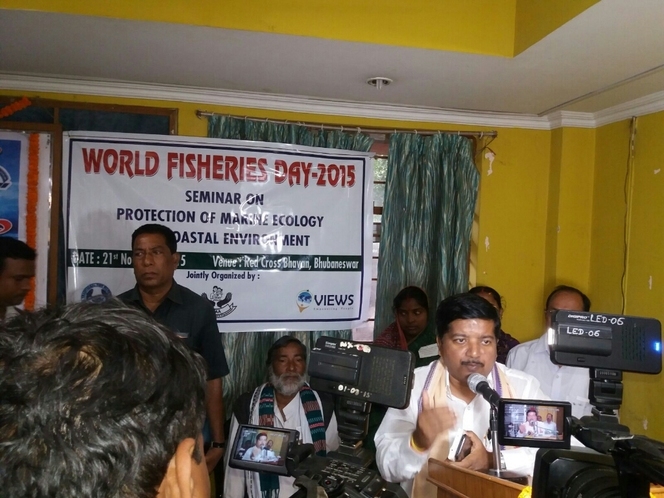 He said that Odisha is the only state to launch a comprehensive Fisheries Development Policy. He highlighted the provisions of different welfare schemes meant for the fishermen community in Odisha. He emphasized that the demand for the development of the marketing infrastructure has been looked in to and he is very hopeful that it would be a reality. Honorable Health Minister Mr. Atanu Sabyasachi highlighted the significance of marine ecology in the context of coastal environment. 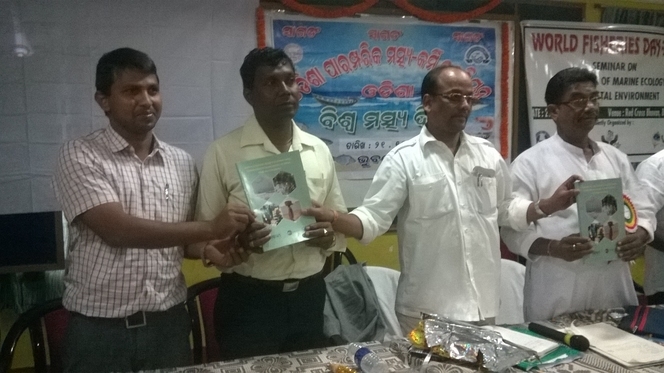 Voluntary Integration for Education and Welfare of Society (VIEWS), a non-profit Organization released the study report on “ Coastal Livelihood Security of Marine Fishing Communities in Ganjam District of Odisha: Issues and Challenges”. Participating fishermen from the districts of Ganjam, Puri, Jagatsingpur, Kendrapada, Bhadrak, Balasore also urged the Minister for policy changes for the betterment and sustainable livelihood of the fishing community. 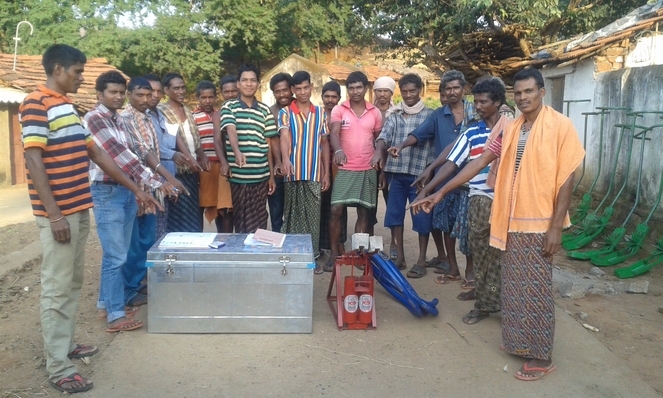 The Orissa Traditional Fish Worker’s Union in the coastal area pointed out the facilities provided by the TamilNadu government. The members urged that the restriction over fishing in the radius of 20 kms from the coast be reduced to 10 kms from the coast. Sea erosion was also a major concern and was discussed by the participants. The state government was requested to solve the problem with the required infrastructure development. Dagesara Majhi & Mirnali Majhi live in a Balki village of Tumudibandha Block of Kandhamal dist. of Odisha.She cultivated millets mix farming through varieties of millets like Foxtail millet 2 varities,Finger millet 4 Varities ,Little millets 3 varieties,Sorghum 1 varieties and pulses 1 varities Ricebin in 2 acre of land.which is 11 varities seed are suppoorted by NIRMAN . This year they are readopted the milletd besed mix cultivation,So this year the diversity of crop like millets &Pulses increased upto 0 varieties to 11 varieties.The current situation of weather is not favorable for paddy. So they hoped that cultivated mixed farm will help to sustain their food need and income. Tangeri Majhi live in a Balki village of Tumudibandha Block of Kandhamal dist. 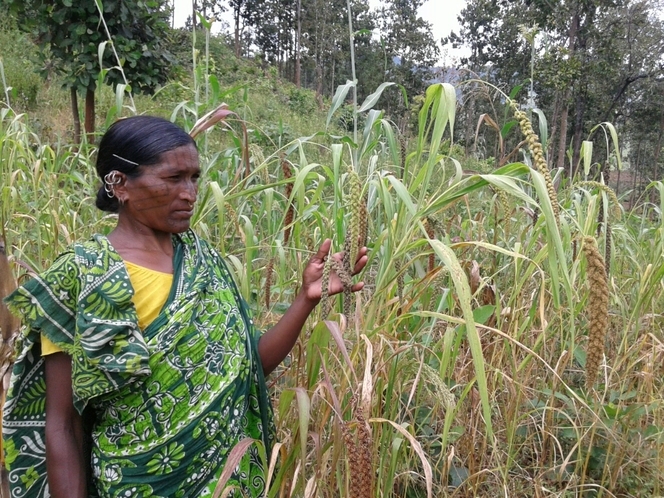 of Odisha.She cultivated millets mix farming through varieties of millets like Foxtail millet 1 varities,Finger millet 3 Varities ,Little millets 3 varieties, ,Sorghum 1 varieties and pulses 1 varities Ricebin in 1.5 acre of land.which is 9 varities seed are suppoorted by NIRMAN .This year they are readopted the milletd besed mix cultivation.The current situation of weather is not favorable for paddy. So they hoped that cultivated mixed farm will help to sustain their food need. Midiali Majhi live in a Balki village of Tumudibandha Block of Kandhamal dist. 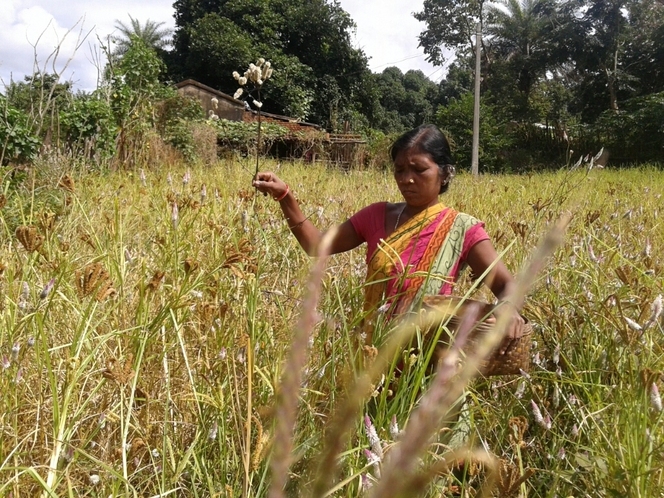 of Odisha.She cultivated millets mix farming through varieties of millets like Foxtail millet 2 varieties,Finger millet 2 Varieties,Little millets 4 variïeties,Sorghum 1 varieties and pulses 2 varieties cowpea and Ricebin in 1.5 acre of land.which is 10 varieties seed are suppoorted by NIRMAN & rest 1 varieties is self conserved seed.This year they are readopted the milletd besed mix cultivation,So this year the diversity of crop like millets &Pulses increased upto 1varieties to 11 .The increased of food grain will help this family to meet of their grain needs and surplus grain sell for market.I am happy to grow the variety of millets crop to my own land.this much variety i used to grow 10 year back. Mirnali Majhi live in a Balki village of Tumudibandha Block of Kandhamal dist. 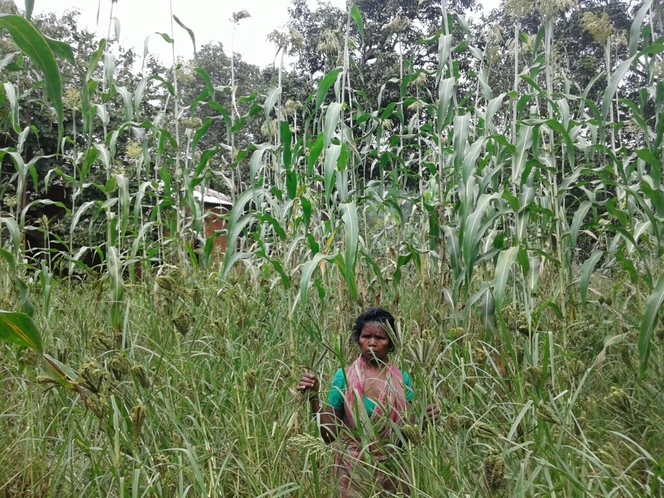 of Odisha.She cultivated millets mix farming through varieties of millets like Foxtail millet 2 varities,Finger millet 3 Varities ,Little millets 3 varieties in 1 acre of land.which is 8 varities seed are suppoorted by NIRMAN.This year they are adopted the milletd besed mix cultivation,So this year the diversity of crop millets increased upto 0 varieties to 8 varieties.Mirnali hoped that cultivated mixed farm will help to sustain their food need. Sudali majhi live in a Balki village of Tumudibandha Block of Kandhamal dist. 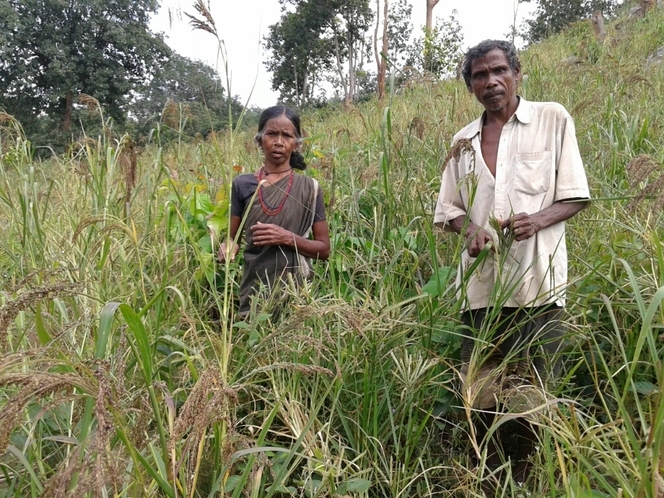 of Odisha.She cultivated millets mix framing through varieties of millets like Finger millet 3 Varities,Little millets 4 varieties,Sorghum in .50 acre of land.which is 8 varities seed are suppoorted by NIRMAN.This year they are readopted the millets besed mix cultivation, Sudali hoped the diversity of food grain will help this family to meet 60 more days of their grain needs.I am happy to grow the variety of millets crop to my own land.this much variety i used to grow 15 year back. Joshep majhi live in a Balki village of Tumudibandha Block of Kandhamal dist. of Odisha. He cultivated Little millets in 0.50 acre of land.which seed are suppoorted by NIRMAN.This year they newly adopted the millet cultivation. Joshep says the current situation of weather is not favorable for paddy. So they hoped that cultivated millet farm will help to sustain their food need. Minanti Majhi live in a Balki village of Tumudibandha Block of Kandhamal dist. 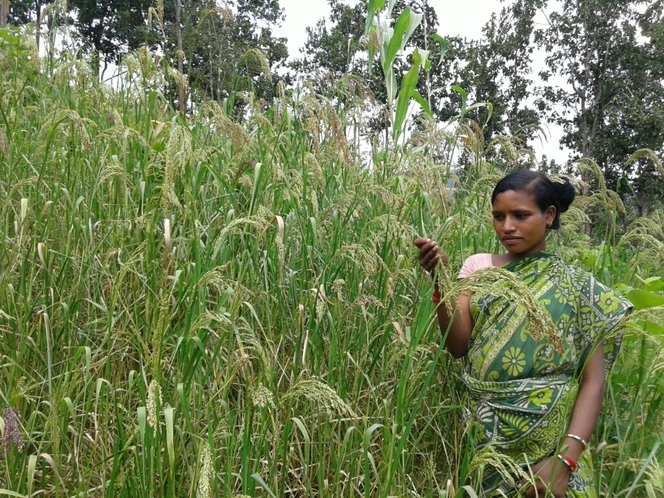 of Odisha.She cultivated millets mix framing through varieties of millets like Foxtail millet 3 varieties,Finger millet 3 Varieties,Little millets 4 varieties,Sorghum 1 varieties and pulses 1 varieties cowpea and Ricebin in 1.5 acre of land.which is 10 varieties seed are suppoorted by NIRMAN & rest 2 varieties is self conserved seed.This year they are readopted the milletd besed mix cultivation,So this year the diversity of crop like millets & Pulses increased upto 2 varieties to12 .The increased of food grain will help this family to meet 38 more days of their grain needs. VIEWS supported to farmers for promotion of vegetable gardens in the field of chatrapur block. To improve household food security and alleviate micronutrient deficiencies, the operational team from VIEWS motivated women to start kitchen gardens in their back yards. 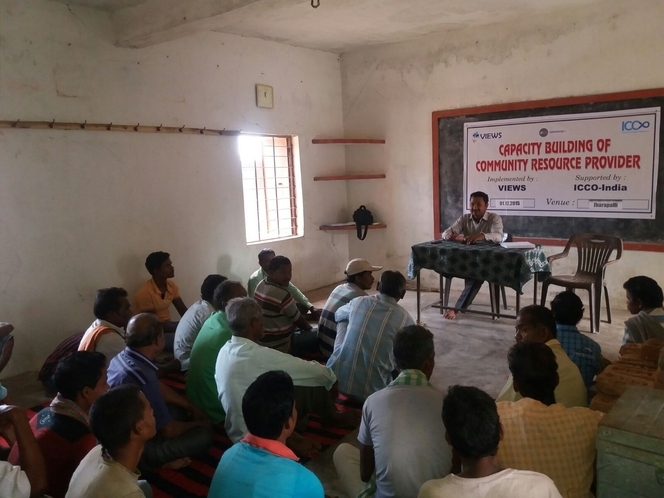 Trainings conducted on sustainable agriculture practices and Improved Agriculture Practices at village and cluster level for the poor farmers helped them understand the importance of Organic manure for the field. 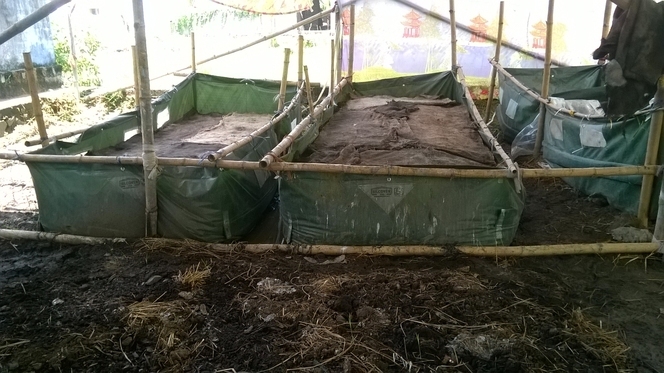 They learnt about the benefits of organic manure in the present context besides the role, function and benefits of the farmers club and how it can benefit the farmers. The participants are now aware of the importance of the nutritional garden and most of them have already started using organic manure for their crops. In this quarter VIEWS supported 513 households for Nutritional garden. Where the households are using the vegetable for their consumption and also they are selling it in their local market. The farmers are selling twice in a week in their local weekly market and earning approximately 400 INR in a week per households. Many young farmers were reassured to get involved in agriculture and were convinced that using the right seeds and technology can help them reap good harvest from their field. The present generations of farmers began to lose interest in agriculture as they consider it is a less profitable profession. The major reason of this is the increasing expenses on chemical fertilizer, pesticides and labor charges for cultivation. They were also convinced about the use of new technology for sustainable agriculture like SRI, multi crop systems and vermin compost. 9 training on sustainable agriculture, germination test, SRI seed bed preparation, onsite training on transplanting and weeding in the SRI Field in Chatrapur, Rangeilunda and Chikiti block with technical support from Agriculture department. As many as 308 farmers participated in 9 training sessions on sustainable agriculture from the above three blocks. VIEWS also provide agri-implements like sprayers, weeders, organic manure and seeds to enhance the yield of the farmers in the above blocks. To improve household food security and alleviate micronutrient deficiencies, the operational team from VIEWS motivated women to start kitchen gardens in their back yards. Vegetable seeds distributed to 513 marginal households for the nutritional garden. This has enhanced food security in several ways, most importantly through direct access the diversity of nutritionally-rich food, increased purchasing power from the savings on food bills and income from the sale of products. 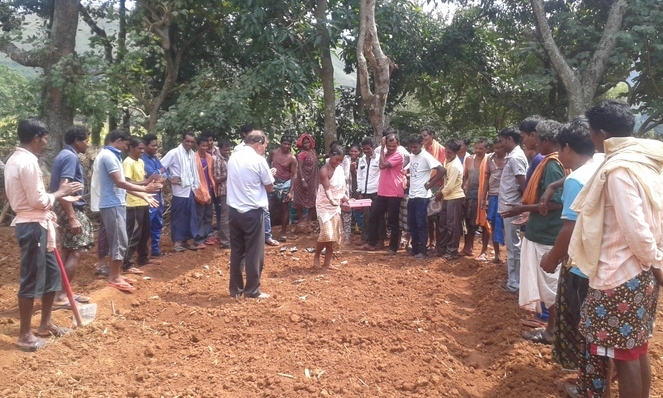 116 compost pits were dug for organic manure at Household level in three blocks of Ganjam district. VIEWS also provide vermin to 10 vermin compost bed to prepare vermin compost in Chatrapur block. 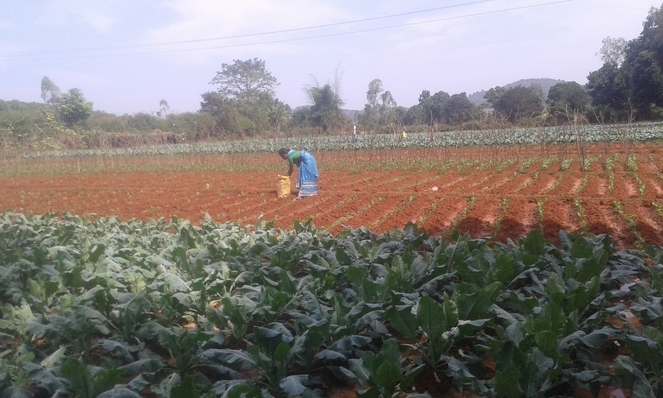 The famers happily applying the organic manure for cultivation of vegetables in organic way and experiencing the visible benefits from the field. Mr. Murali Pradhan is a progressive farmer from Kishore Chandrapur village of Chikiti Block facilitating as a community resource person and provides handhold support to the marginal farmers on sustainable agricultural practices in the field. He has 20 years of rich experience in farming. 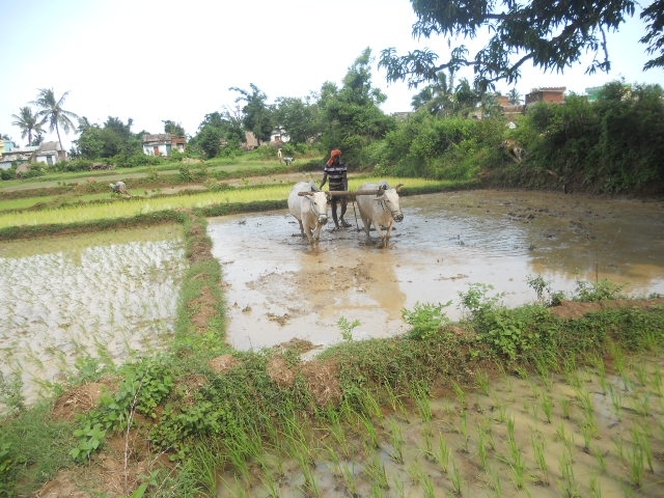 He was cultivating paddy, vegetables in his field. 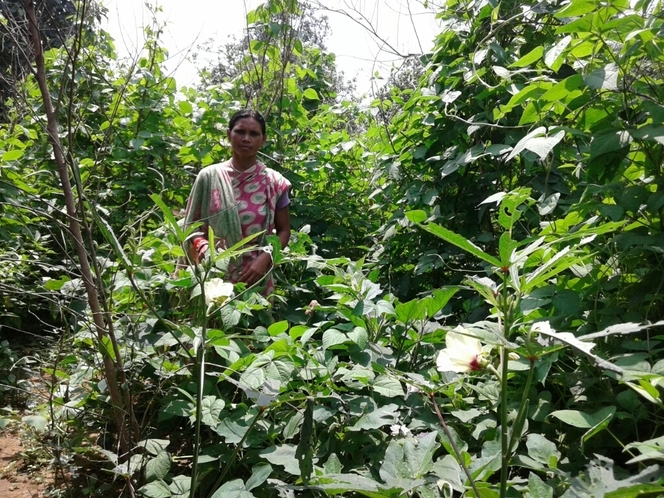 The farmer trained by VIEWS on sustainable agriculture practices, SRI; prepare organic manure and ot her packages of practices on various series of trainings. 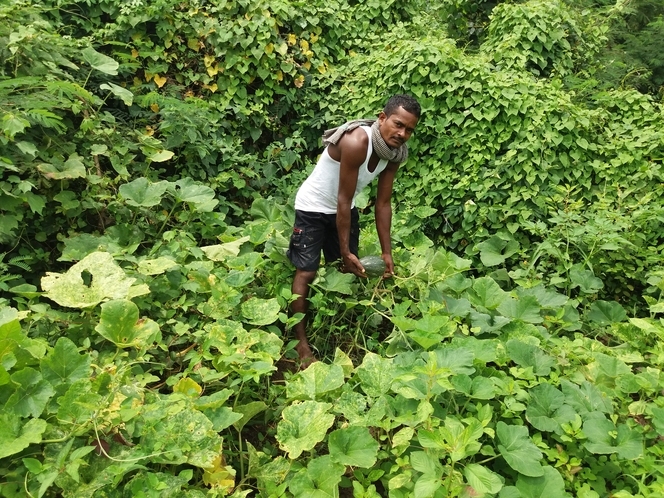 He is practicing himself the organic manure (Handikhata, Magic Tonic, and Fish Tonic) in his vegetable field and also shares the Package of Practices (PoP) on agriculture to other fellow farmers. He acknowledged that prior to this year he was following the traditional practices but after intervention of the VIEWS he learns the new technology and he used less paddy seed than the traditional paddy cultivation. He is also telling that it is taking less time to transplanting than the traditional cultivation. 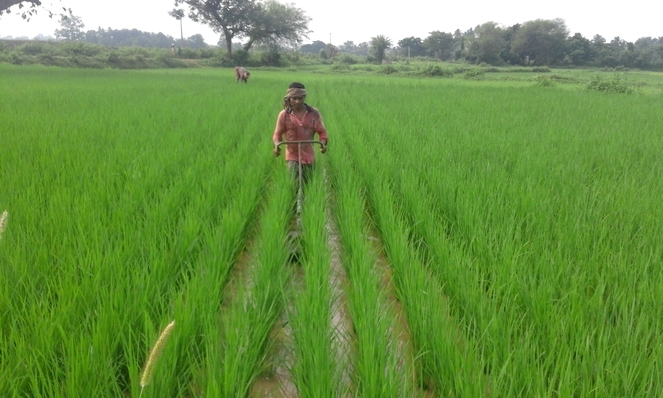 He is very happy that he learned the new technique, which is reducing the expenditure in cultivating paddy and vegetable. Now he is working as the community resource provider and providing hand holding support to the farmers of his area. With the motivation and handhold support of the Murali Pradhan the other farmers of Govindpur Gram Panchayat are following the SRI and organic farming and playing a active role in ensuring the sustainable agriculture practices in this area. The women from the fishermen community are very much experience in fish business, but due to lack of financial resources they are not able to get the expected income to run their family. After intervention of Voluntary Integration for Education and Welfare of Society (VIEWS), it supported the Self Help Group in the operational area. With the support of VIEWS the member of Self Help Groups are doing fish business and getting a sound income which helping them to manage their house hold expenditure and the expense for children education. 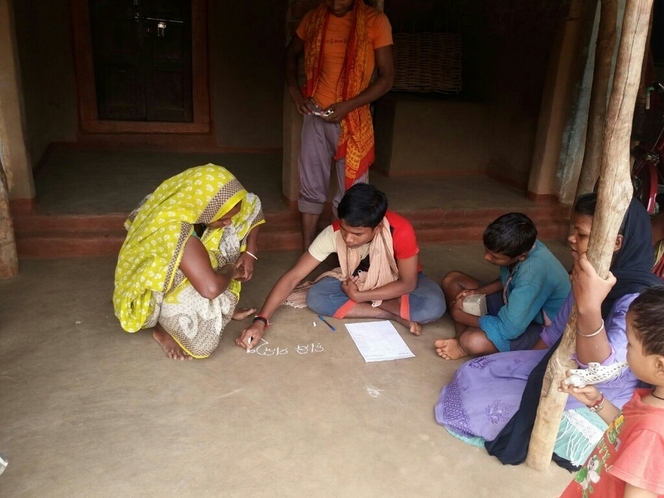 Voluntary Integration for Education and Welfare of Society took an initiative to make literate to the villagers, So it took in a campaign mode that, know your signature. The staff of VIEWS teach the villagers to know their signature with the support of the school children. It is a campaign in the village of Terabasa. 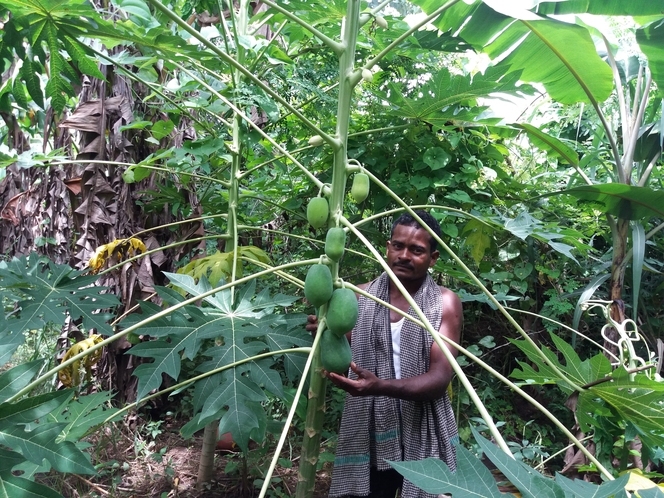 With the support of Voluntary Integration for Education and Welfare of Society (VIEWS), the villagers are doing vegetable cultivation in their land to enhance their economic status. 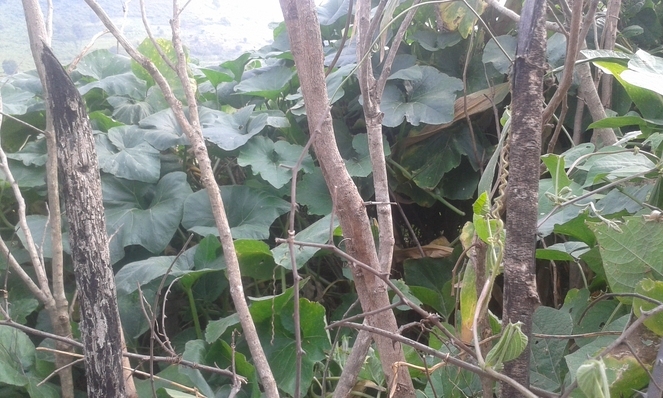 Its a very good news that villager are using organic manure in the their vegetable farming. 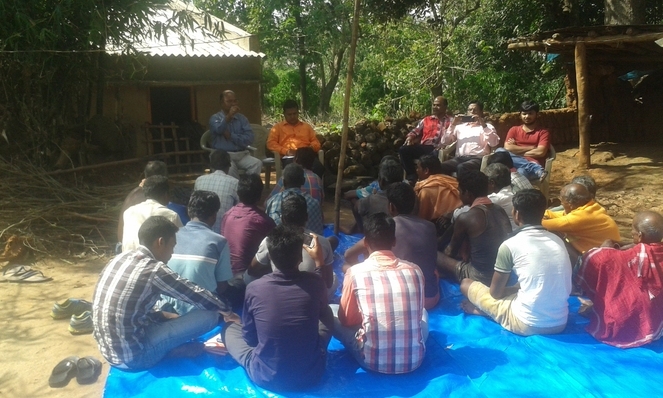 The villager of New Boxipalli and the staff of Voluntary Integration for Education and Welfare of Society(VIEWS) doing Participatory Rural Appraisal in the village of New Boxipalli village. Mrs. Susama Behera is a progressive farmer in Jagatapalli. 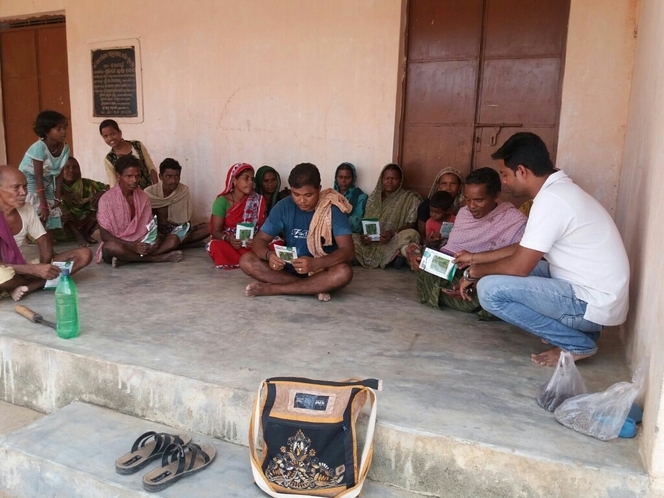 The villagers of Jagatpalli didn't know the about System of Rice Intensification (SRI). 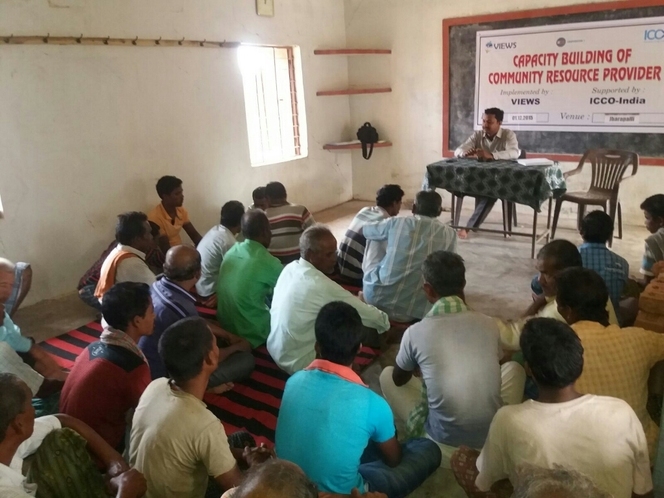 After intervention of Voluntary Integration for Education and Welfare of Society (VIEWS), the staff of VIEWS provide different training to the farmers of Jagatapalli and the farmers learnt the process of System of Rice Intensification (SRI) and adopted the process of SRI. At the time of weeding the staff of VIEWS providing onsite training to the progressive farmers for the use of manual weeder. 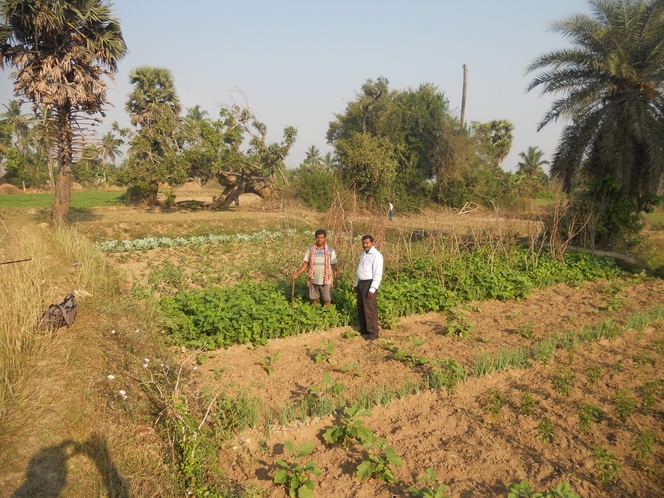 Duyrodhan Birod of Khilaput cultivated a 3 acres of land for vegetable cultivation. Namely he has cultivated Cabage, Curliflower, brinjals and beans. He is having a dream of selling the product in the market and with the profit constructed a house for him. 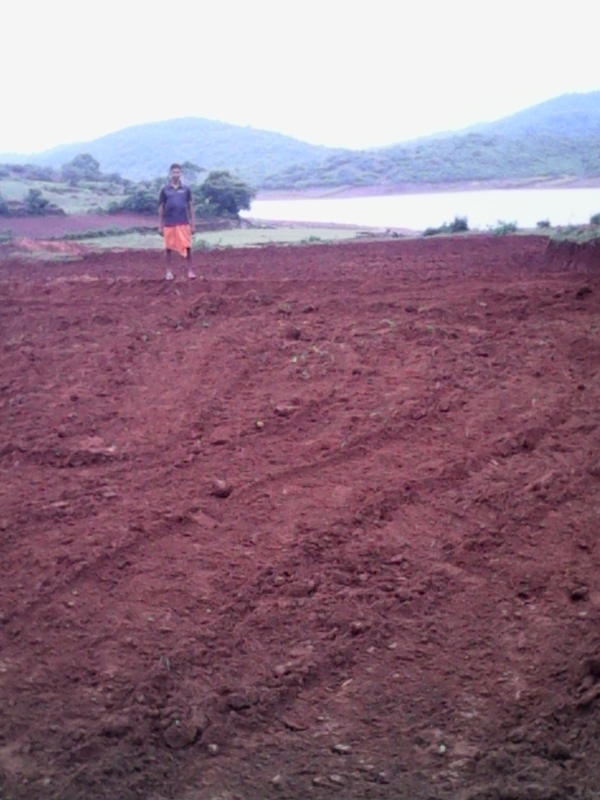 Satybadi Birudi of Khilaput renovated his a piece of land near to his habitation to do agriculture work. Previously there were bushes and eneven stony patches. with the support from SLIO project he could do the land cultivable. Board of Directorsand shareholders of Jagruti Farmers Produce company, Laxmipur assembled on 8th November 2015 at Podasinkuli for developing a business development plan. Mr. Jagadish Pradhan and Hemanta Naik from SVA facilitated the meeting anf helped the directors for chalkng out the same. Raimati Naik of Khilaput cultivated cabbage, Cauliflower, beans, Chilly in 10 acres of Land by applying organic practices. She applied water from the nearby dugwell and vermin compost from the compost pit in the land. 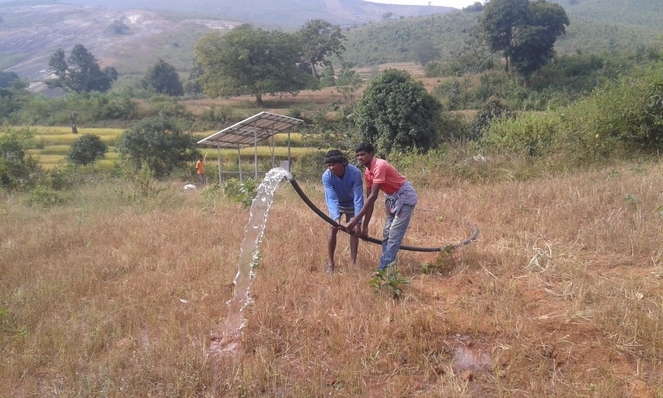 Tirnath Naik from Khilaput, a displaced village of Uppor Kolab, dug a shallow well in his plot with the support under SLIO project @ 20000/- with a labour contribution of Rs.8000/-He has targeted to irrigate 10 acres of land for cultivating vegetable namely beans, cabbage, chiili and brinjal. Marnali Majhi live in a Balki village of Tumudibandha Block of Kandhamal dist. 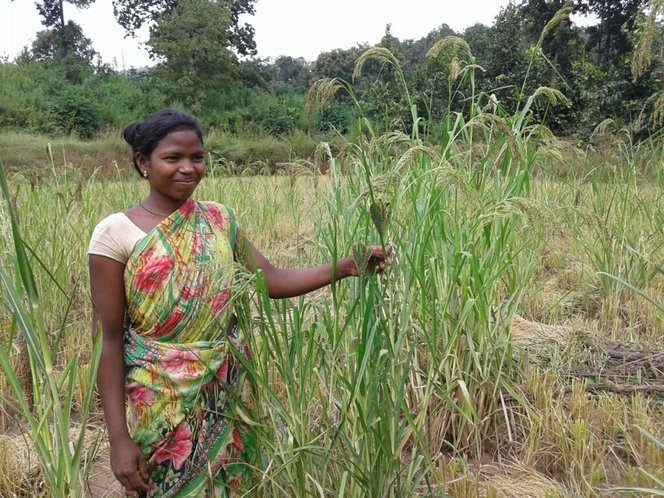 of Odisha.She cultivated millets mix framing through varieties of millets like Foxtail millet 3 varieties,Finger millet 4 Varieties,Little millets 4 variïeties,Sorghum 1 varieties and pulses 2 varieties cowpea and Ricebin in 2 acre of land.which is 10 varieties seed are suppoorted by NIRMAN & rest 4 varieties is self conserved seed.This year they are readopted the milletd besed mix cultivation,So this year the diversity of crop like millets &Pulses increased upto 4 varieties to14 varieties.The current situation of weather is not favorable for paddy. So they hoped that cultivated mixed farm will help to sustain their food need. 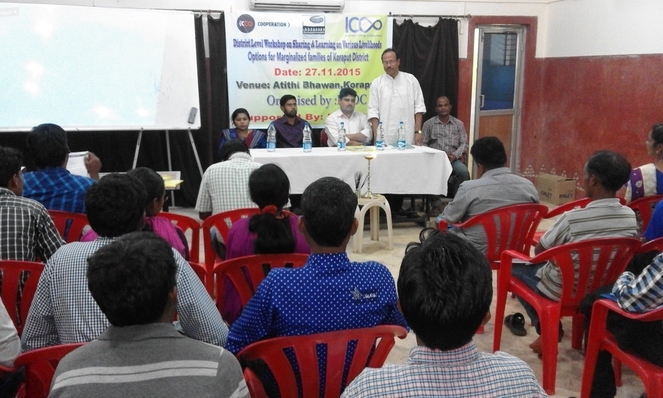 Mr. Murali Padmanavam was facilitating the training on initiative of disability and inclusion of development at Bhubaneswar, Odisha. Participant from four partner were participated in this training program. In this training there are 8 differently abled persons were also participated. Mr. Murali Padmanavam facilitate this training very well by giving different examples and giving some of the related situation. 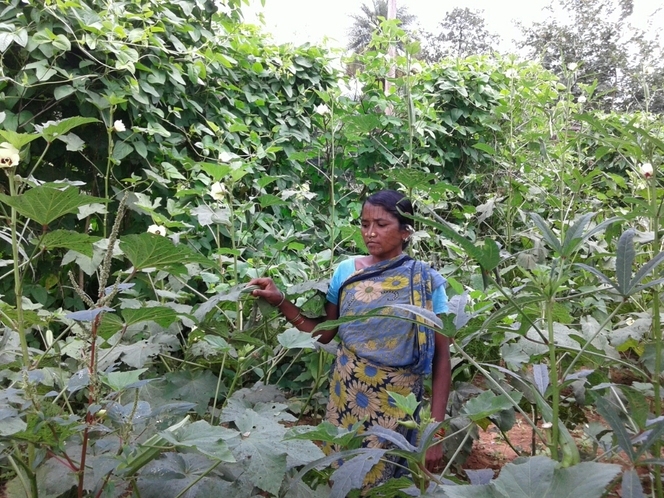 Unanti Mallick live in Risagpanga village of Tumudibamdha Block of kandhamal dist of Odisha.She cultivated 8 varieties of vegetable in 12 dismil of land for which seed varities are supported by NIRMAN.She is getting fresh nutrition vegetable for her won family consumption so support her family to market dependacy will be decrease up to minimum 2 to 3 month. Sajuri Mallick of Risagpanga village Sirla GP of Tumudibamdha Block of kandhamal dist of Odisha.She cultivated 5 varieties of vegetable in 12 dismil of land for which seed varities are supported by NIRMAN.She is getting fresh nutrition vegetable for her won family consumption so support her family to market dependacy will be decrease up to minimum 2 to 3 month. 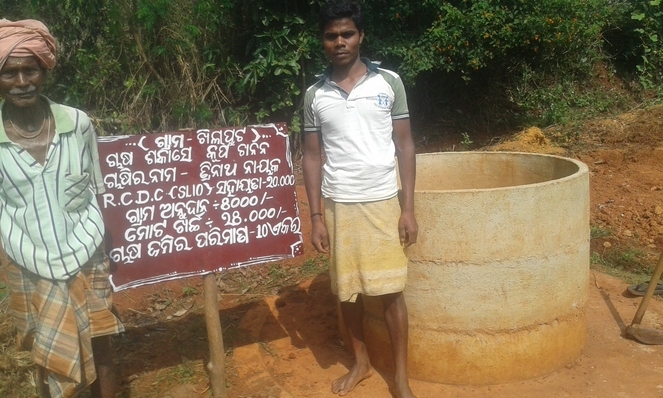 Naneswar Mallick lives in a village Resamgpanga,Tumudibandha Block of Kandhamal dist. 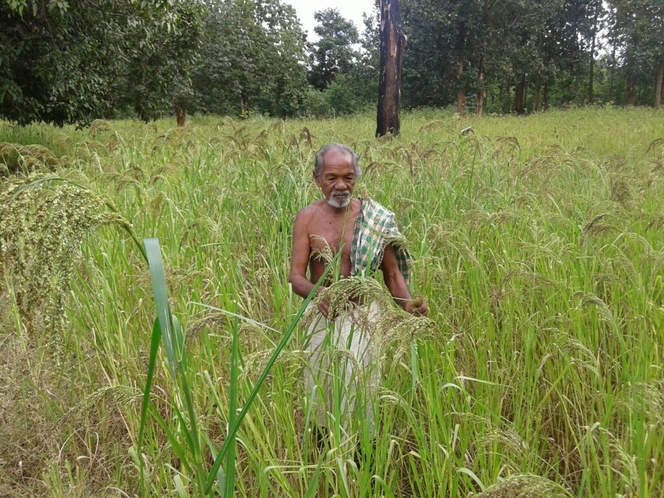 of Odisha.He is cultivated Traditional paddy in 1.5 acre of land for their family food need. 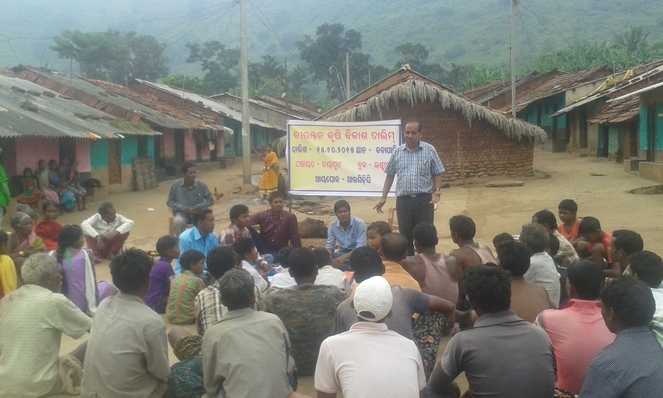 Sabetri malik live in Pidamaha village of Tumudibandha Block of Kandhamal dist. of Odisha . 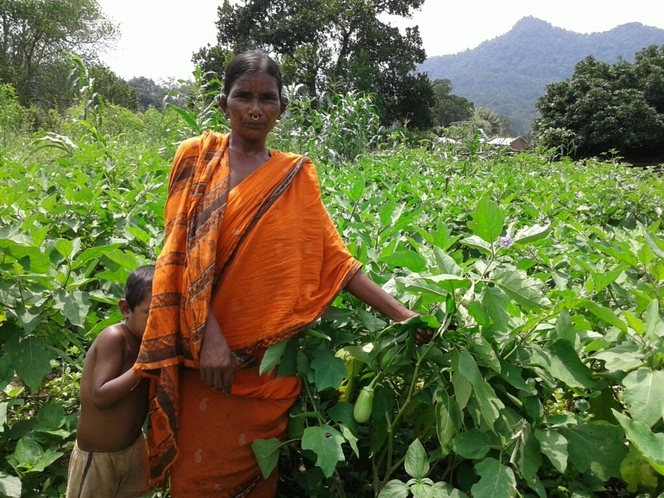 She cultivated 6 varieties of vegetable in 25 dismil of land for which seed varities are supported by NIRMAN.She is getting fresh nutrition vegetable for her won family consumption and also earn from vegetable selling. 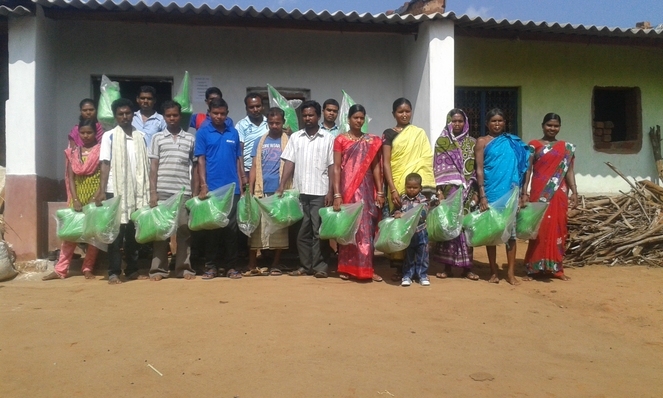 On 21st October 2015 Vegetable seeds were provided to cultivate in the Farmer's Field School at Kishor chandrapur. Seeds like bitter gourd, cluster bean, bean, tomato, brinjal, Radish and knol khol. 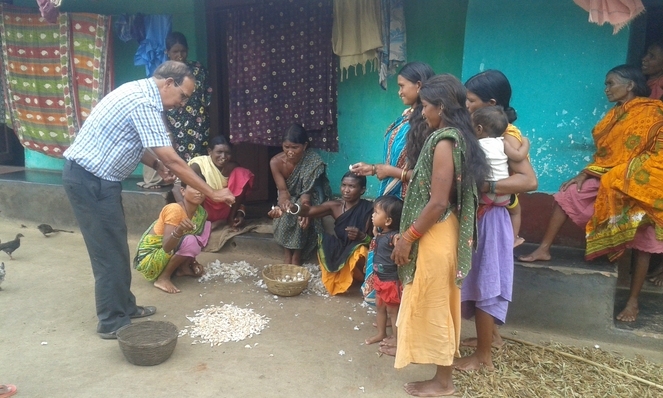 Vegetable seeds like bitter gourd, cluster bean and bean were provided to 22 households from jharapalli village Govindnagar of gram panchayat of Chikiti block. Budhei pradhan, an old widow women lives alone. She is not capable of collecting woods for her daily cooking need and also lacks electricity in her village. Under ICCO-Udyama Livelihoods program, Budhei provided with an integrated energy unit with two solar lights and a fuel efficient stove. 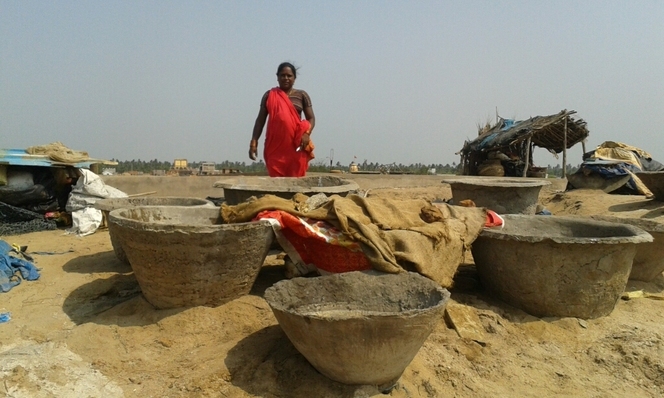 Those help her in managing her difficulty of collecting fuel wood and lighting requirement. This supported in reducing her misery at this stage. Siluan, a village in Titlagarh block of Bolangir district having around 400 household. A tailoring training unit is being run by ICCO_Udyama sustainable Livelihood Program. The unit cater the training need of 25 women from the village. The women will undergone a training for 4 months and this is the last month of the batch. 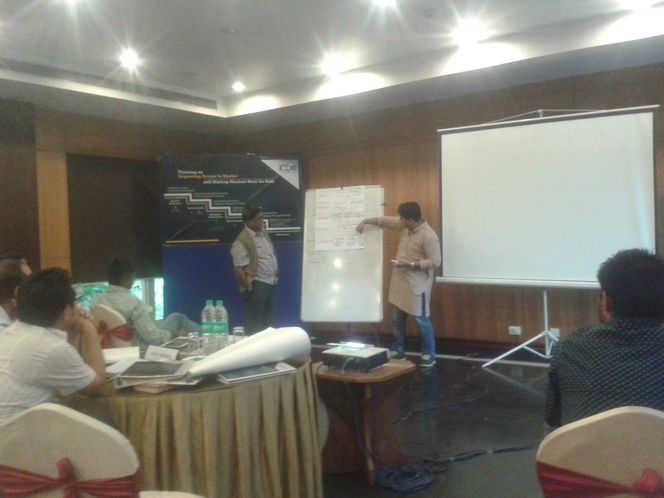 The participants have already been covered with the course at the last fortnight of the training. The group hope that they will earn a additional livelihoods for their family by using their off and spare time. 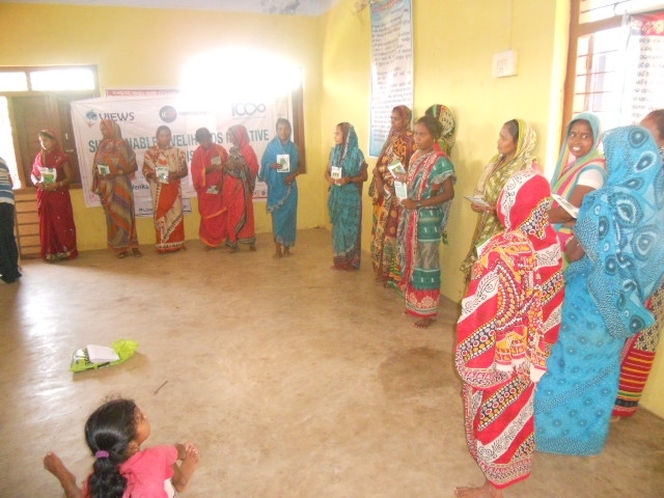 Participants also formed a group (SHG) to do mutual help within. 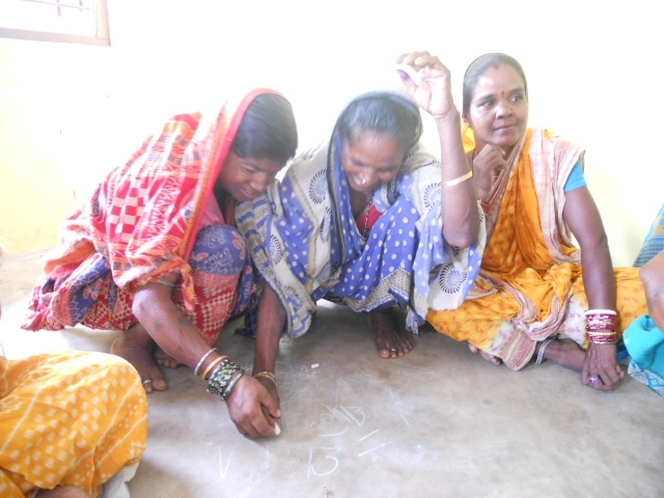 After intervention of VIEWS, the villagers mobilised to form farmers club and women self help groups. The community based organisatons started monthly saving and opened a bank account in the name of groups. Along with, they actively engaged in livelihoods promotion, kitchen garden, village cleaning and other village developmental activities in the village. 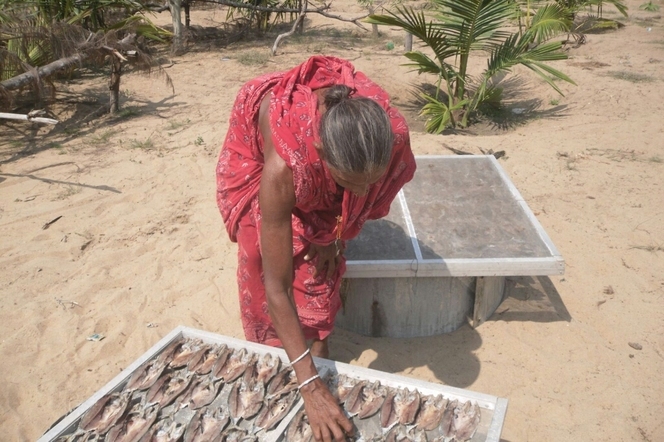 The women self help group of marine fishing communities started dry fish business with the support of ICCO in new boxipalli. 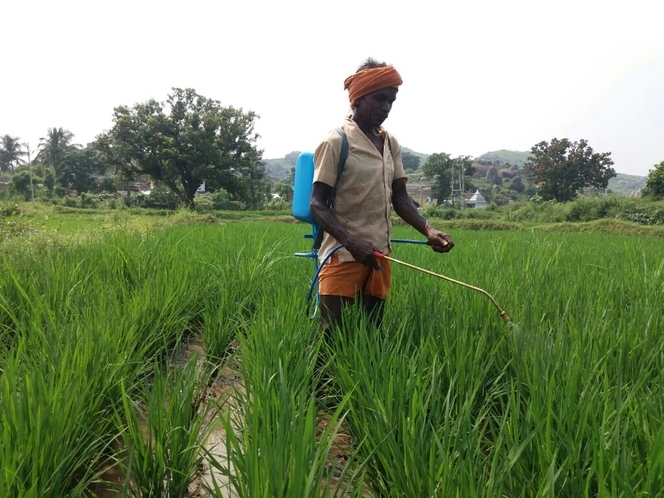 Mr. Sina Sabar of Sorabikrampur using the mandua weeders in his field. 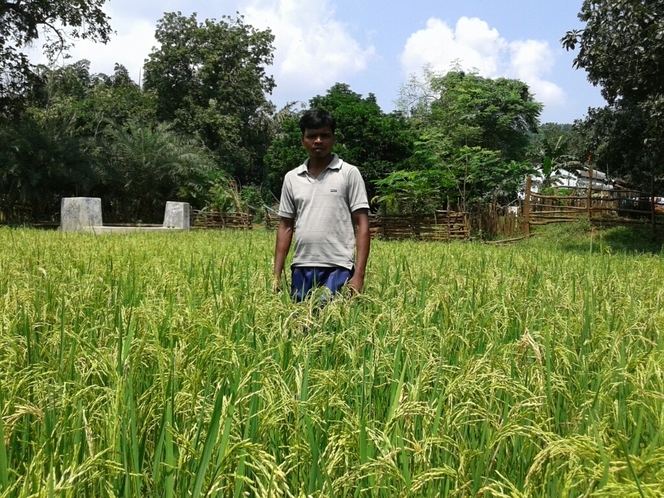 He is one of the interested farmers to do paddy cultivation by using weeder. 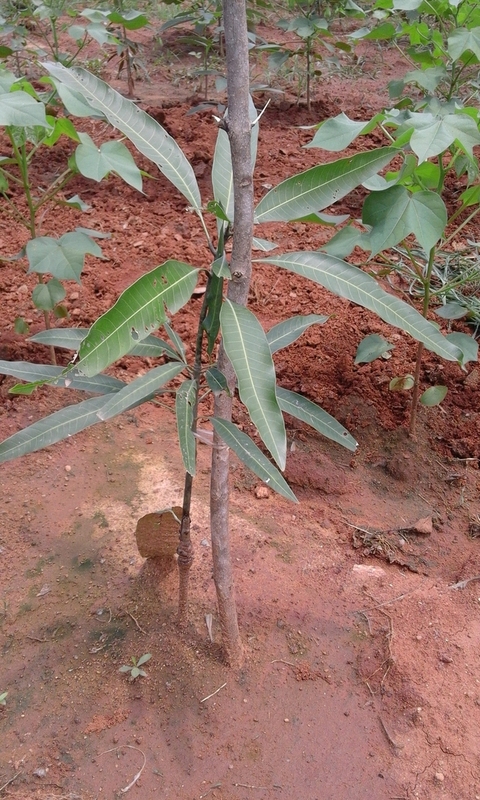 Mango and Bela plants are supplied to the farmers for raising forest plantation in Toramul of Gunpur block.45 nos of saplings are being provided to the community. Bali Hikaka learning the application of mandua weeder from the Agriculturist in Podasinkuli village. Mr. Kadengaga has given training on the practical use of weeder among all the farmers supported by Weeders in the entire village. 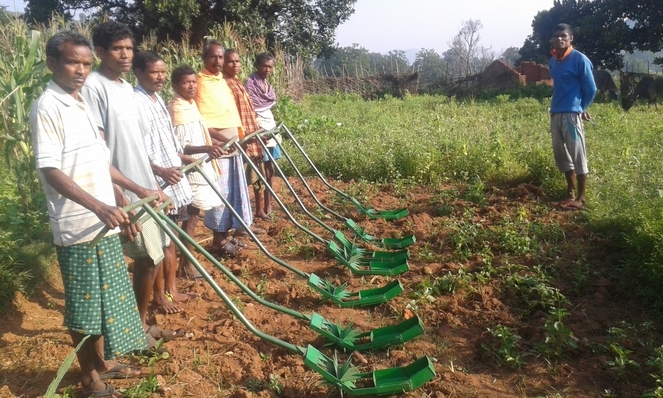 With a purpose to promote SRI, Mandua Weeder is provided to the interested farmers in Minapai village in Laxmipur block. With the weeder the farmers are doing cultivation in the village. 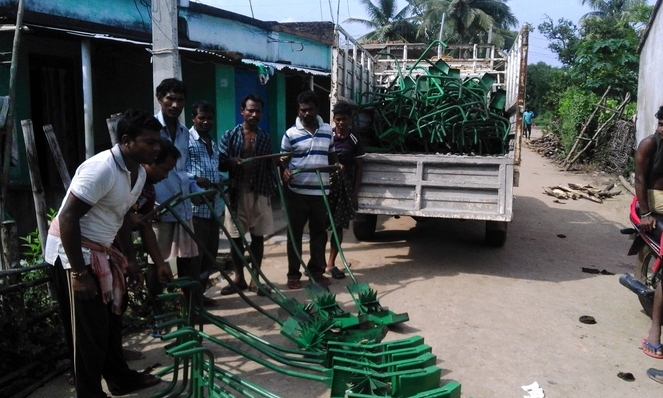 100 nos of farmers are identified in entire Laxmipur block and provided with Mandua weeders. 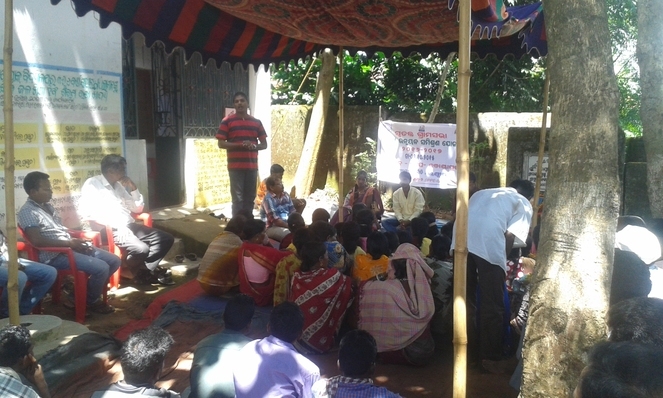 Health and sanitation training is organised in Raisil village on 13.10.2015 for 40 nos of people. 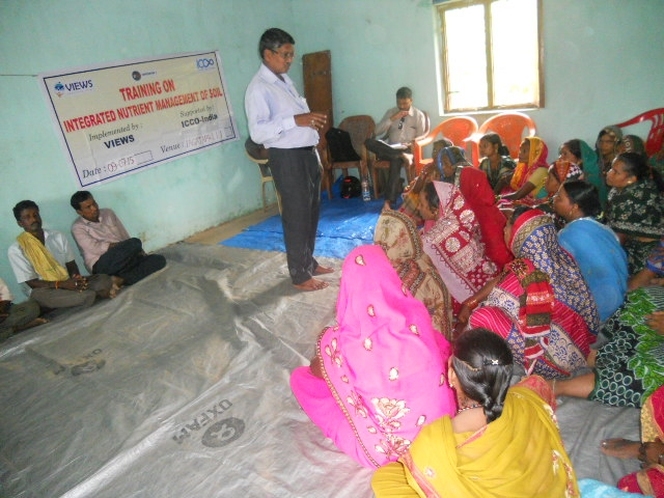 Local Anganwasi workers and ANM facilitated the training on personal hygiene and health. 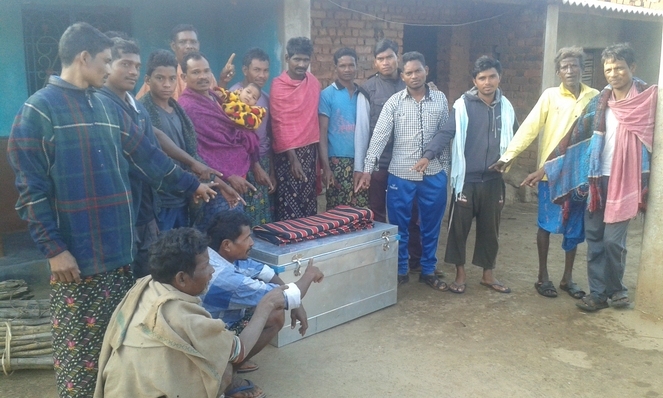 A community Seed bank is being facilitated in Dhamangada of Laxmipur block. The members of seed banks are collecting the traditional seeds and kept in a iron box for safe custody. During the need the farmers will take the seeds on loan manners and repay it back after harvesting. A block level work shop is organised on 14th Oct. 2015 KVK Hall of Gunpur on the role of NGOs in development. The work shop was witnessed by 92 people from VDC,CRPs, Govt activists, PRI members, Press and media and discussed on various issues of tribal people on their livelihoods. PPP on SLIO project was displayed. 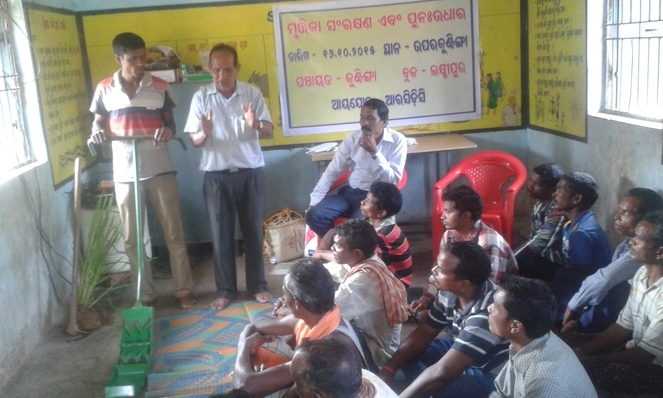 Mr. Sabhapati Khadenga, Agriculture Scientist and Agriculture Extension Officer giving training to 40 nos of farmers from 4 villages on soil improvement and coservationon 16.10.2015 at Upar Kutinga.In addition use of weeder is given. 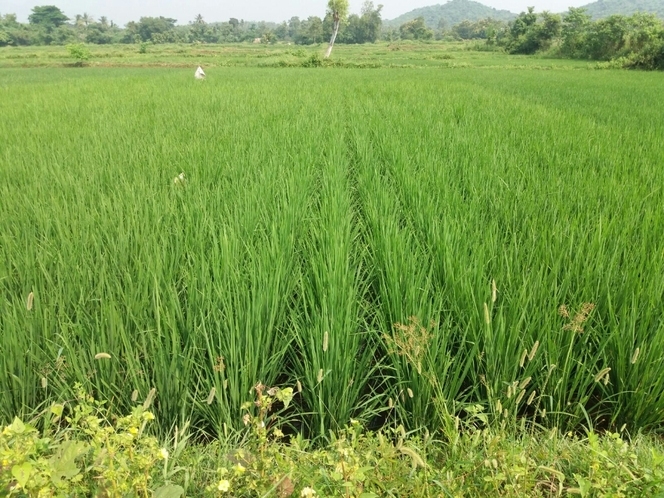 VIEWS under ICCO project trained the farmers and supported to farmers for paddy cultivation under SRI method.Now the farmers very happy after seeing paddy progress in the field. The farmer in palli village applying organic mannure in agriculture field. 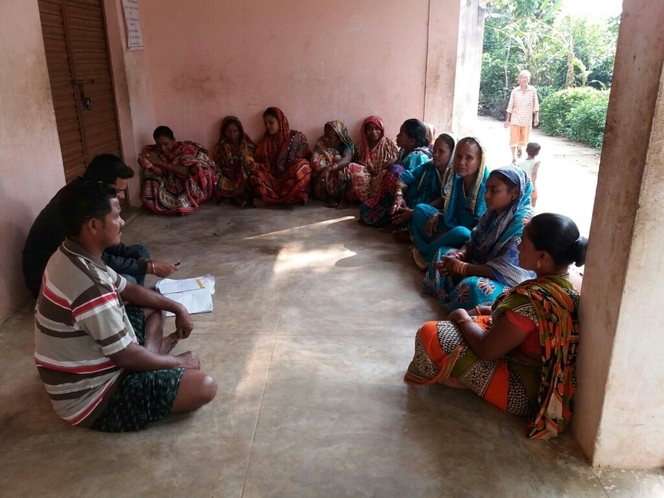 The project aims to ensure food and nutrition security among tribal, Dalits, and other backward families in south and central Odisha by enhancing production and income of 8016 families through community resilient farming systems to climate change by the year 2015. 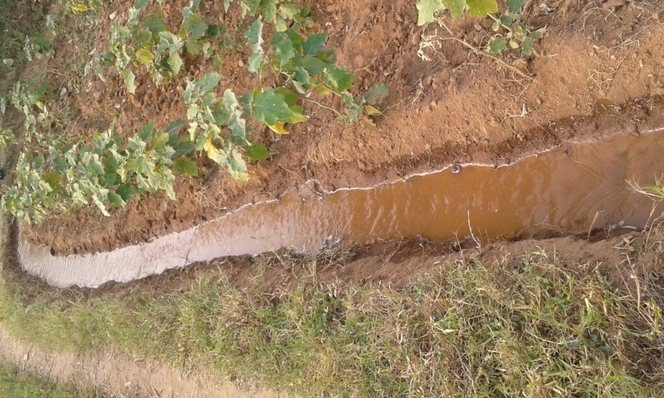 In order to to ensure food and nutrition security through Institutional Process for Learning, and Management of Common Resources, the project will focus on the following: • Community Mobilization and Group Formation • Knowledge Building on Sustainable Livelihoods • Management of Individual and Community Assets • Scaling Up of Successful Interventions • Demonstration effect and Engagement with other Stakeholders • Influence Benign Policy towards Livelihoods Security Promotion of Climate Adaptive Sustainable Livelihoods System through • Sustainable Farm, Forestry, and Fishing intervention • Soil and Water Conservation • Micro and Village based Enterprise Promotion by Value Addition • Nutrition, Water and Sanitation Awareness • Non Farm Intervention – Individual and Groups • Demonstrative Sustainable Energy Interventions for Potential Scale Up The project would focus women’s involvement in the intervention. The project strategy would be to promote and strengthening CBOs like Women’s SHG, farmer’s club, produce’s group, village development committee and cooperative society based on the local context and needs. In the CBOs, more than 50 % would be women and play vital role in access and control over assets and services at household and community level. The beneficiaries belong to Schedule Tribe (ST), Schedule Caste (SC), Fisher folk and social excluded communities in the target villages. The project will be implemented by a network of 4 NGO partners (UDYAMA, NIRMAN, VIEWS and RCDC). As a network there is strength of numbers, scale, ability to influence and moreover learnings from each others’ successes and failures. The project will significantly affect the lives of CBOs/SHG members in their income generation activities, livelihood security and self employability. It will strengthen the target communities’ income generation opportunities through tools and capacity building support. It is expected that the program participants will continue the livelihood practices, which directly contribute to increased family income. Further, the groups will continue to access resources from financial and government agencies through the linkages created under the project. Partners plan to continue the project with the help of income generated from the Producer cooperatives consisting of various producer groups and the external support received from government programs and other agencies. Partners will continue to play an active role to facilitate the CBOs/SHGs to strengthen links with government schemes and projects so as to generate the required assistance. Internal income will be generated from membership fees, donations and revenue generated from community based institutions. The project will promote Producer Cooperative/groups with objective of sharing information, conducting training, providing financial and non financial services to its members. The Society, on the completion of the project, plans to raise its own funds through membership development fees, nominal fees charged for its services to the groups, benefit events, grants from the government and ICCO in future. The revenue generated will cover the Producer Cooperative’s/groups operating expenses as well as minimal support to the groups created under the project.